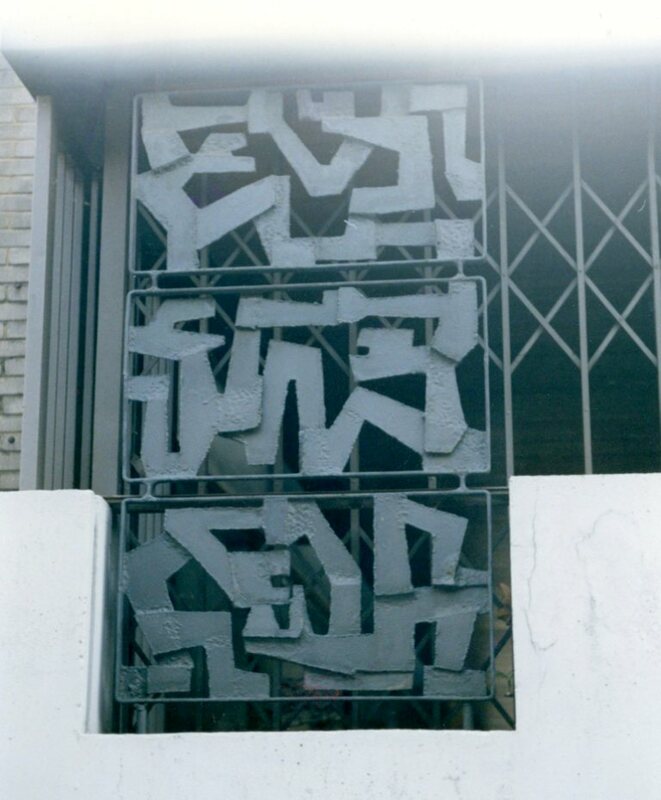 This week we’re having another near random look through the Chelsea pictures of A W (Bill) Figg, beginning with this decorative feature. As I’ve mentioned before, Figg was a devotee of the small features or details which can be found on many buildings. Some will seem familiar or almost familiar and you will swear you can recall them. Others remain obscure or unknown. One of these days I’ll fill an entire post with them but not this week. It’s not entirely clear from the pencil written note next to the picture which tells us that the feature was “taken down”. 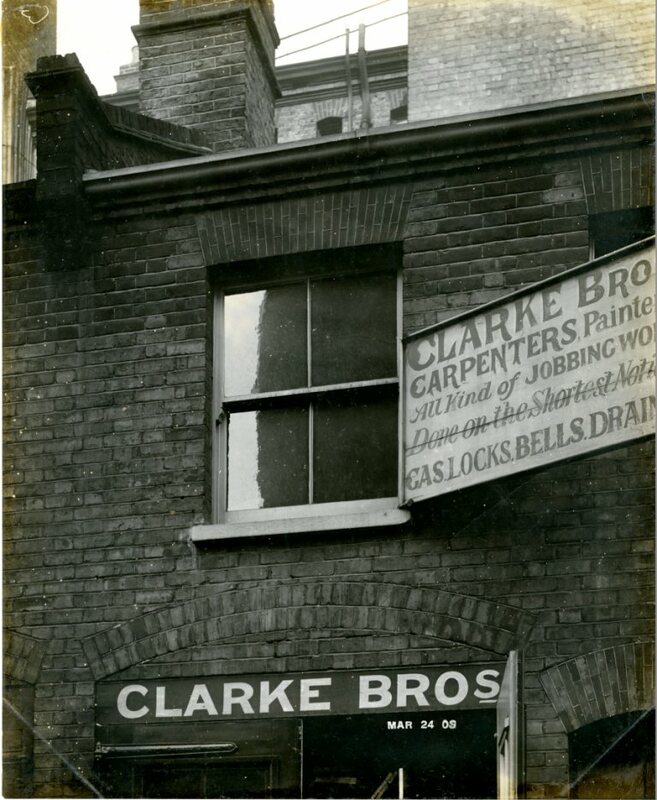 I’m assuming it was in Pavillion Road, the narrow street behind Sloane Street because the pictures accompanying it is captioned as such. But I’m going to leave that until the end. 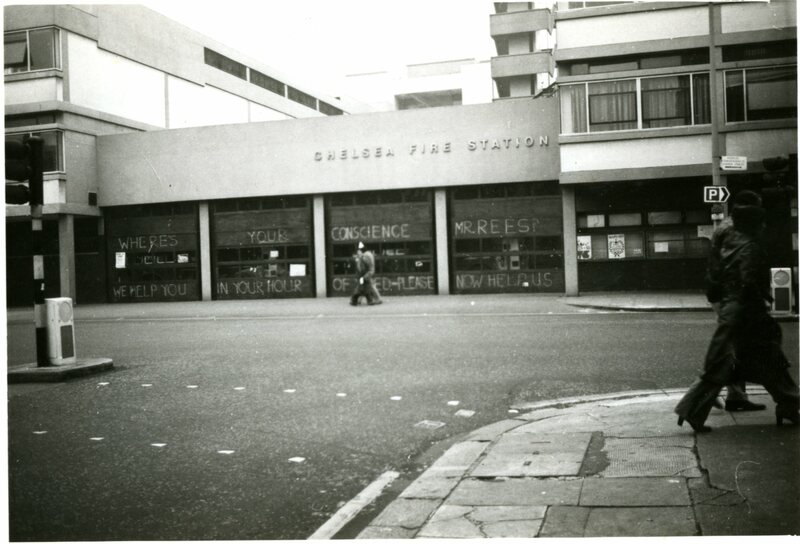 This picture is of Chelsea Fire station. Can you make out the message? “Where’s your conscience Mr Rees? We helped you in your time of need, now help us.” This was the Firefighters strike of 1977 and Mr Rees was Merlyn Rees, the Home Secretary of the day. I set off down a mental side track at this point recalling that just as the army deployed the “Green Goddess” fire trucks during the strike, the army were also used in the 1989-90 ambulance strike. I remember that because my wife had a kidney stone during the strike and was taken to the old Westminster Hospital in a military ambulance. Happy days. There is no connection between that event and this view of the burial ground in Dovehouse Green. 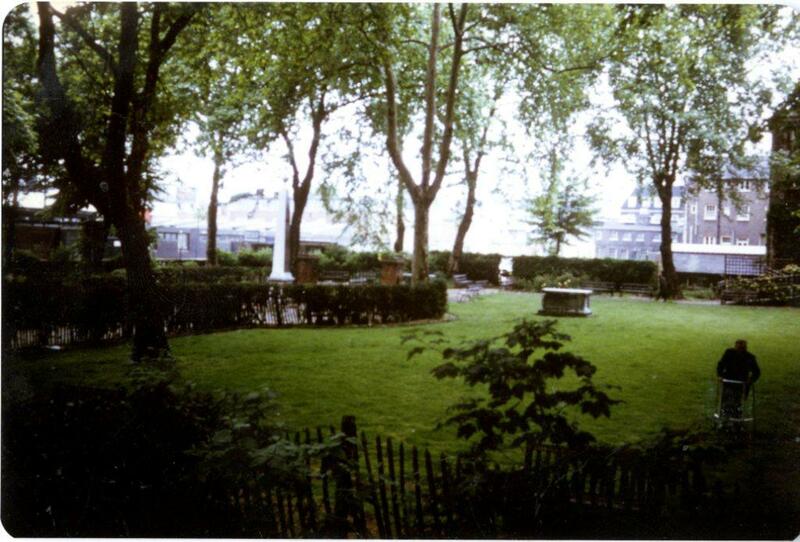 As you can see from the layout, this shows the green before 1978, when it was landscaped and arranged as it is today. The obelisk monument to Philip Miller one of the gardeners at the Chelsea Physic Garden, which now sits in the centre of the green (and hasn’t moved) is seen here behind a hedge. This view, down the central path is looking north. 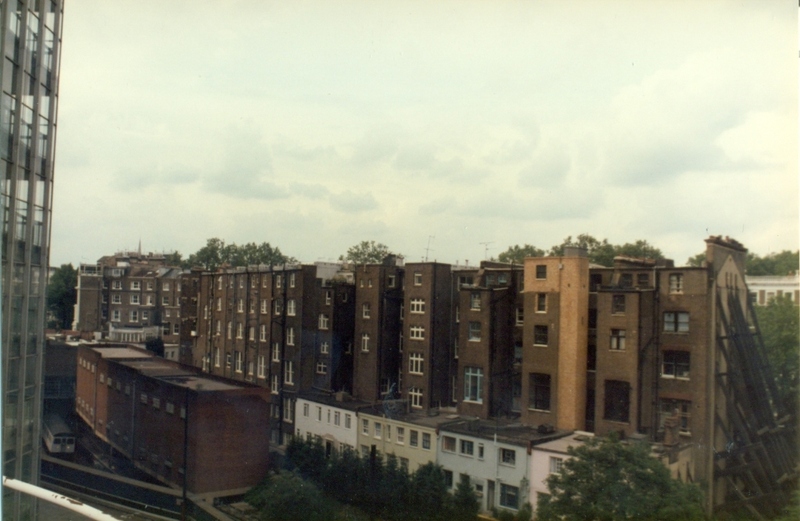 It shows the Thamesmead old people’s home and part of the workhouse buildings. 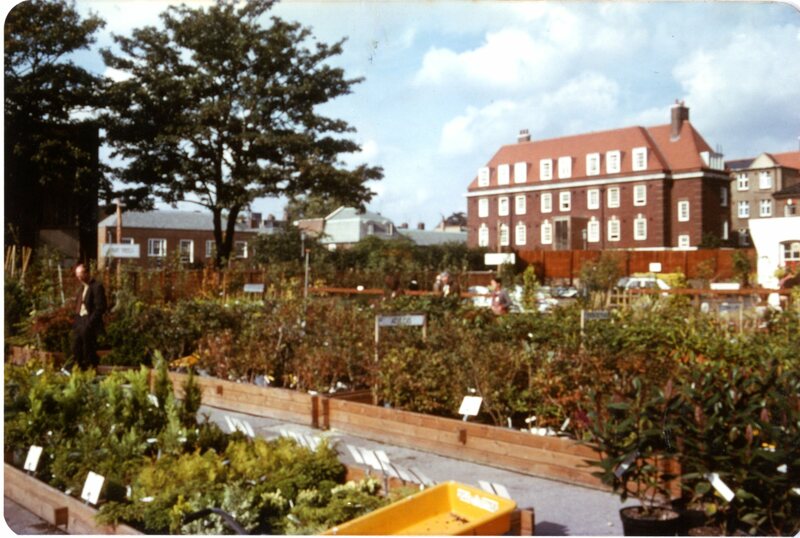 The picture below shows the nursery section of what is now the Chelsea Farmer’s Market. 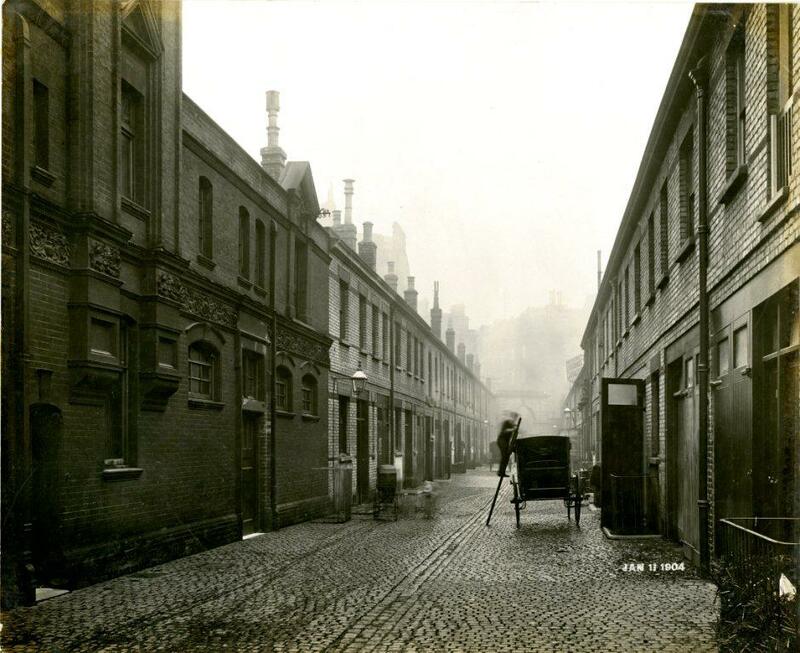 The picture below shows the edge of the nursery building and the short terrace of houses next to it in Sydney Street. Did the nursery ever go by the name of Jack Beanstalk? Take a note of that brown car in the foreground. 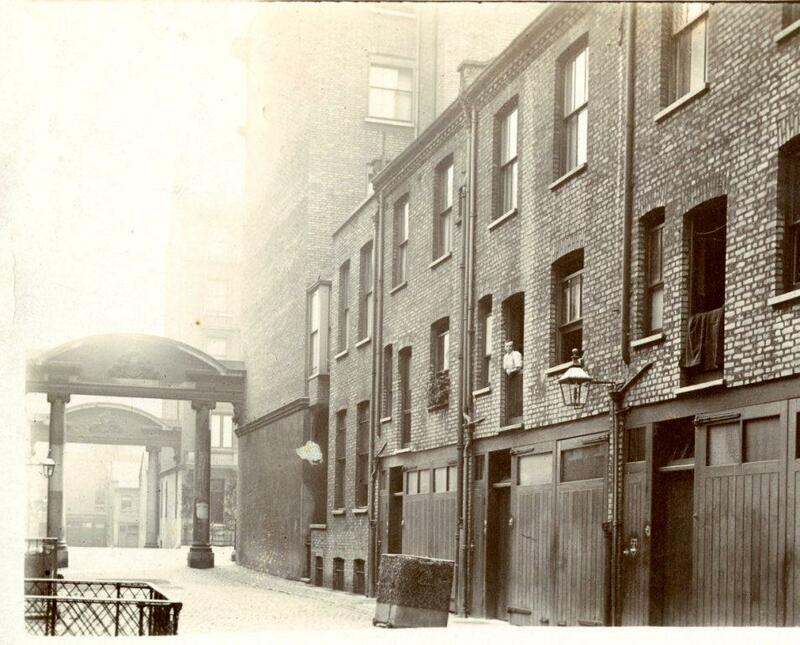 Below, is Hemus Place, off Chelsea Manor Street, another side street which fascinated Figg. He must have been carrying two cameras that day because here it is again in colour, featuring the same vehicles. 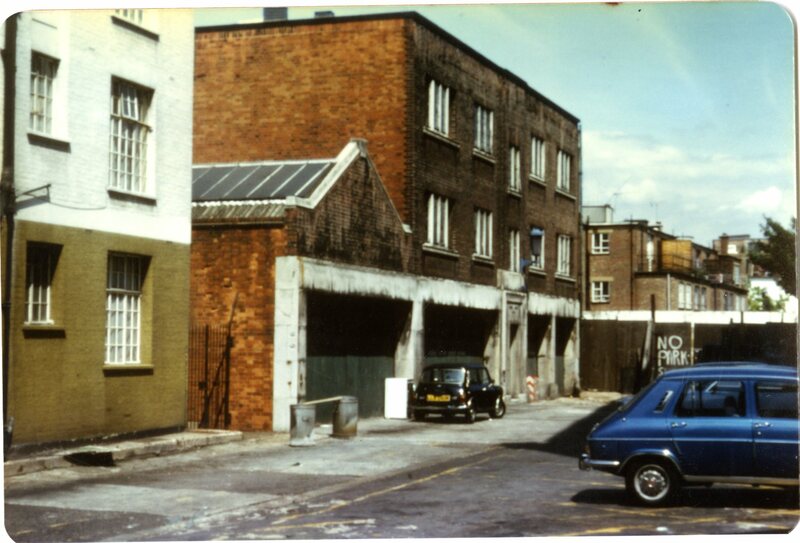 ust an urban backwater in the 1970s, but now the loading bay and delivery pick-up point for the Waitrose branch in the King’s Road. 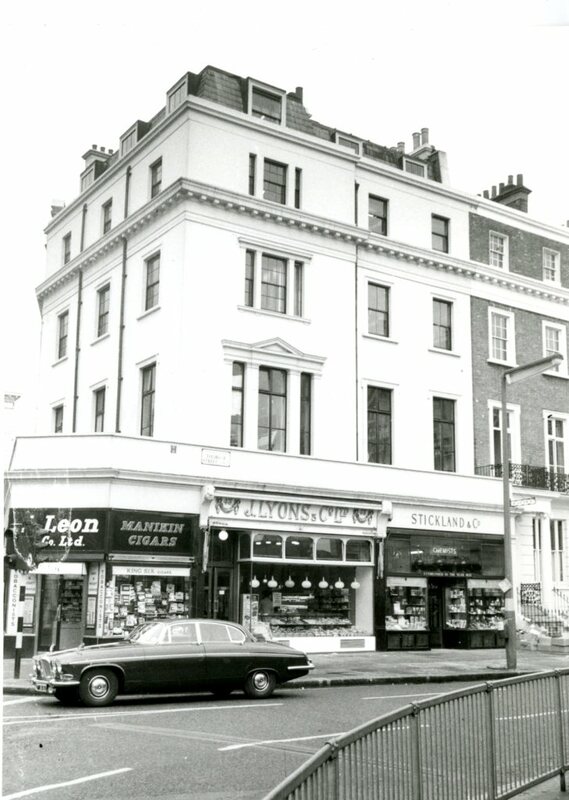 We’ve seen in a previous post how Waitrose had a comparatively small frontage, behind which was a substantial shop. Figg’s 1990 photo shows a new building and a reception hut. 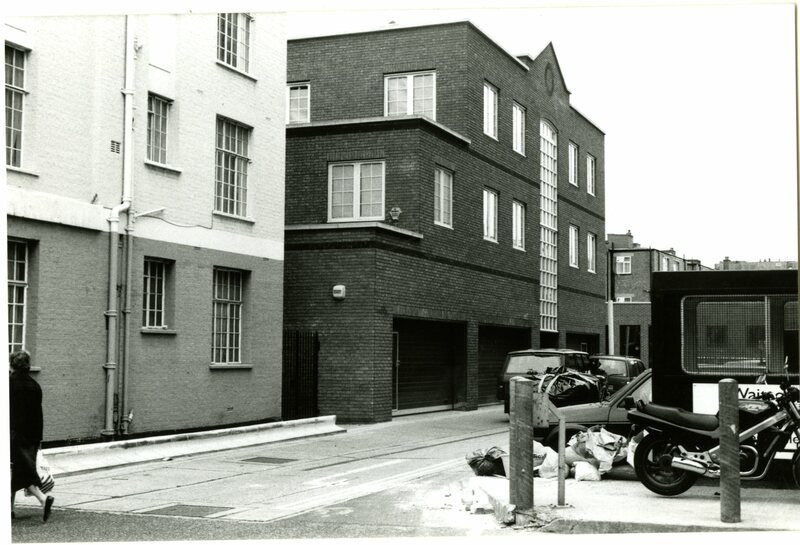 Since then a block of flats Friese-Green house has been built here, at the rear of the Odeon / Habitat building. More changes are under way at the moment. 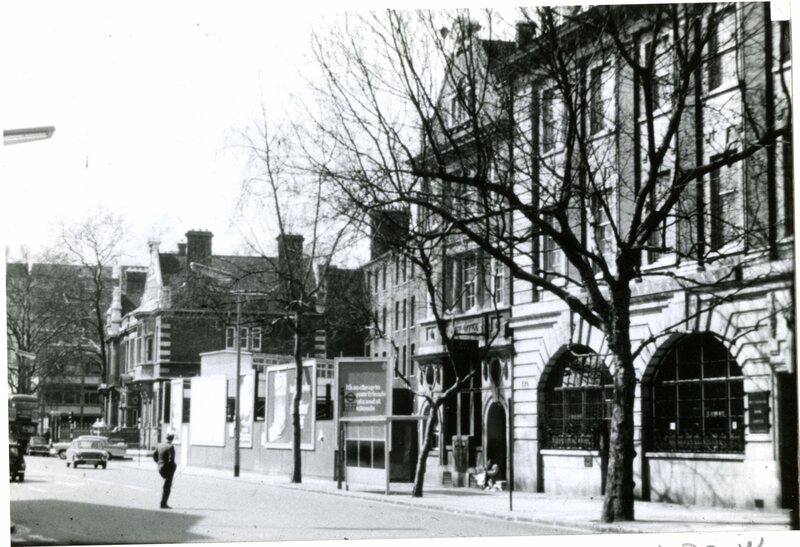 In another bit of then and now (or strictly speaking then and then), here is the bank /post office building on the corner of Manor Street, and the site of the the recently demolished Chelsea Palace Theatre opposite the Town Hall. 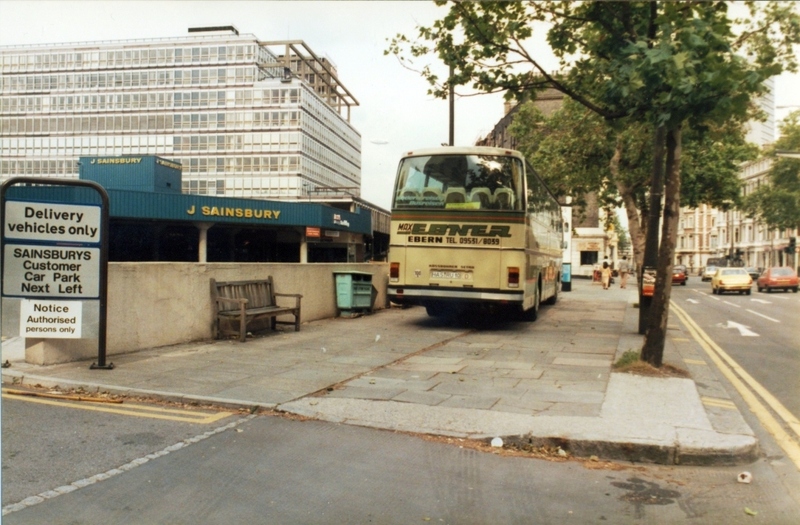 The first shopping based building on the site was called simply the Gallery, (with its “indoor waterfall” – anyone remember that?) 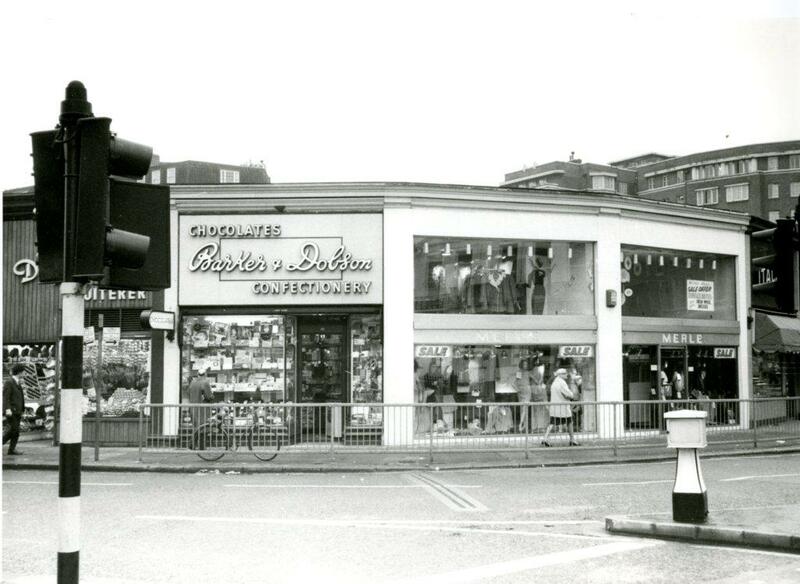 Later it was replaced with a branch of the Reject Shop. Like Timothy White’s (see last week), this is another place where my wife and I bought many household items. Finally (almost), back to Pavilion Road. The building is not especially distinguished but the car (compare it with the brown car in the picture above) sets off many memories for me. Just skip the next two paragraphs if you’re not interested in cars, or my employment history. 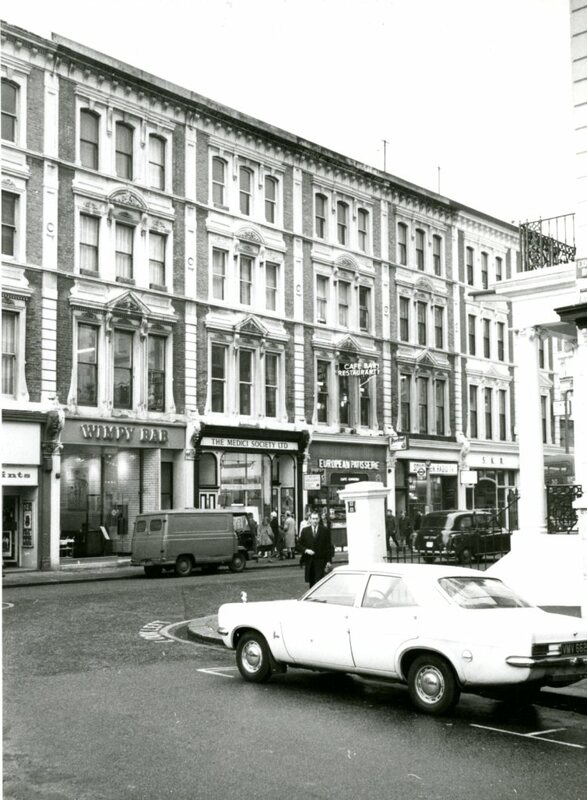 Back in the last years of the 1970s I worked for a garage in Soho which had a British Leyland franchise. 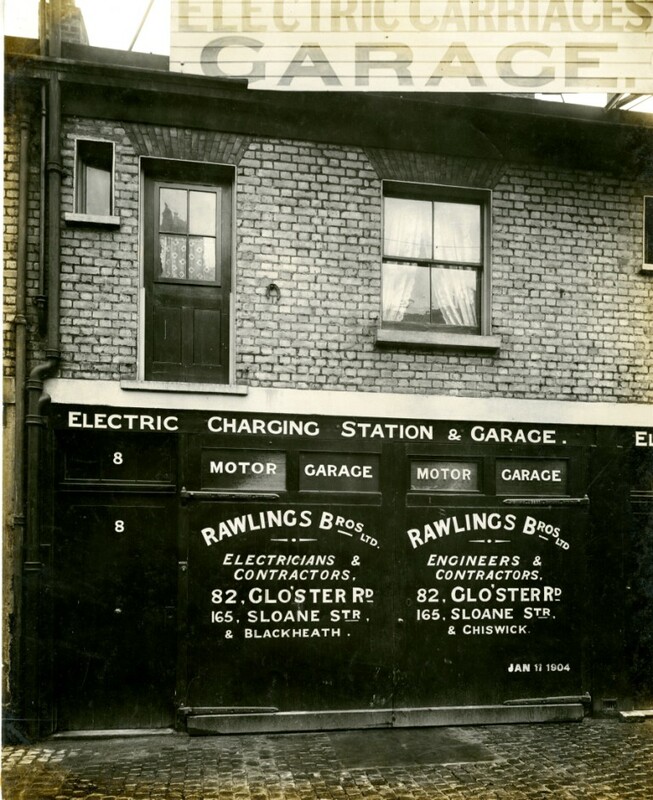 In those days the cars from BL were the last gasp of a fading company. They had Allegros, Marinas, a few Triumphs and MGs. In the mid market saloon car range they were beaten hands down by Ford, who had a new Cortina, a new Granada and the Mark 2 Capri, all much better than anything BL had to offer. In some ways worse was to come with the Princess, a car so bad and ugly it seems to have been erased from history. (One month I cleaned and prepared an entire fleet order of these, which earned me a good bonus, but inflicted considerable psychic damage). The one bright light was the new Rover, a completely redesigned version of the V8 3.5 litre saloon for middle managers, company directors and other aspirational types. For months before its launch it had been hidden from view under the project name SD1, and when it came out as the Rover 3500 it was a success for the ailing company and was Europen Car of the Year for 1977. The sales manager at the garage had one problem – he couldn’t get them (supply was another perennial problem.). So I never actually dealt with many of them but we would stand around and admire the few examples that came in. Apparently the police liked them too. BL created a police version for them and when the range was coming to an end a consortium of police forces bought everything that was left and stored them around the country so they could carry on using the car for years to come. Time though, has been no kinder to the SD1 than it was to the Princess and while the previous versions of the Rover are now classics, the SD1 has joined much worse cars in motor vehicle limbo. You can apparently see SD1s driven by George Cowley in the Professionals and John Steed in the New Avengers. 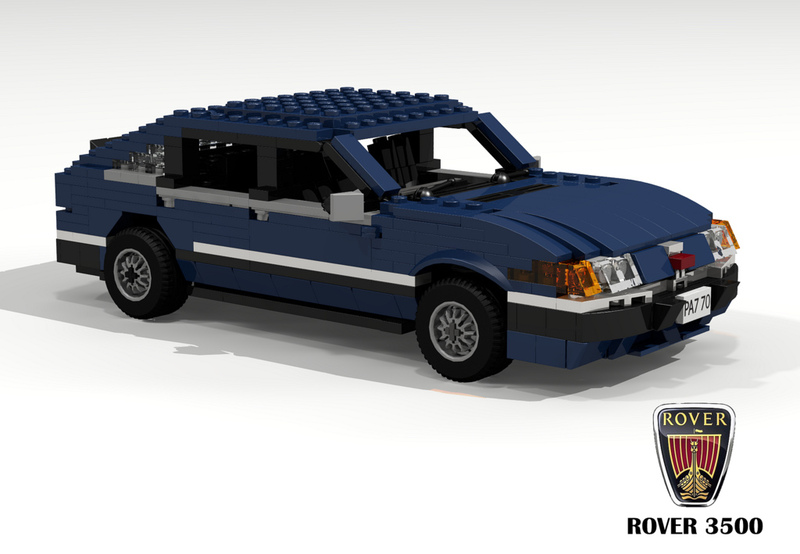 And here’s a Lego version. Did Figg know all that, or is it just me, my friend Steve and a few other Rover affianados? I am anticipating a few comments on this matter. I thought this was Sydney Street at first, but I can’t figure out how the big building in the distance, and the old buildings on the left fit together. And it’s all a bit faded. So if someone can say for sure, I’ll be grateful. This week’s post is written by my colleague and friend Isabel Hernandez. It’s a day later than usual, but that’s my fault, not hers, as I was off for a few days after a minor medical procedure. It has been a little while since my last contribution to The Library Time Machine, and I am long overdue on this blog that, really, should have been written several months ago. It was during this time that I was fortunate to have met local photographer, Peter Dixon, during an exhibition that was held in the Central Library and organised by the Gloucester Court Reminiscence Group. 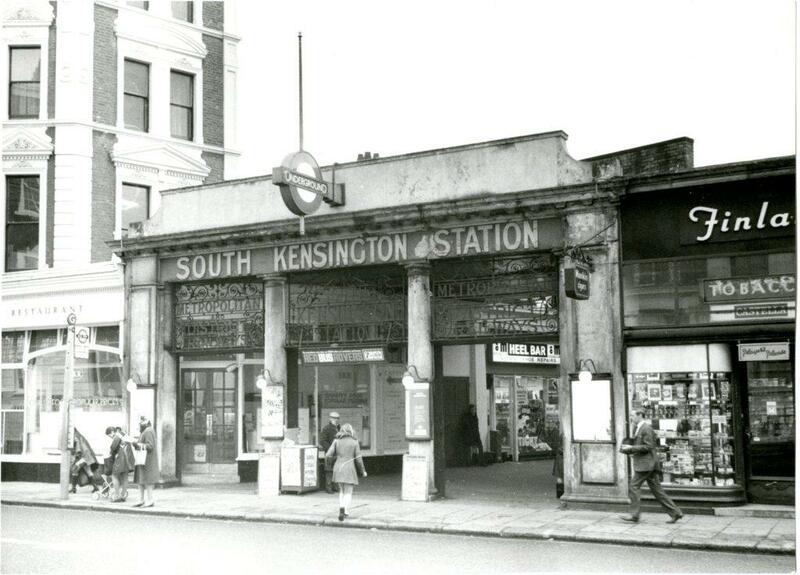 On display were some fantastic photographs he took in the 1950’s and 1960’s, mainly of the North Kensington and Paddington areas, which had never been seen before. 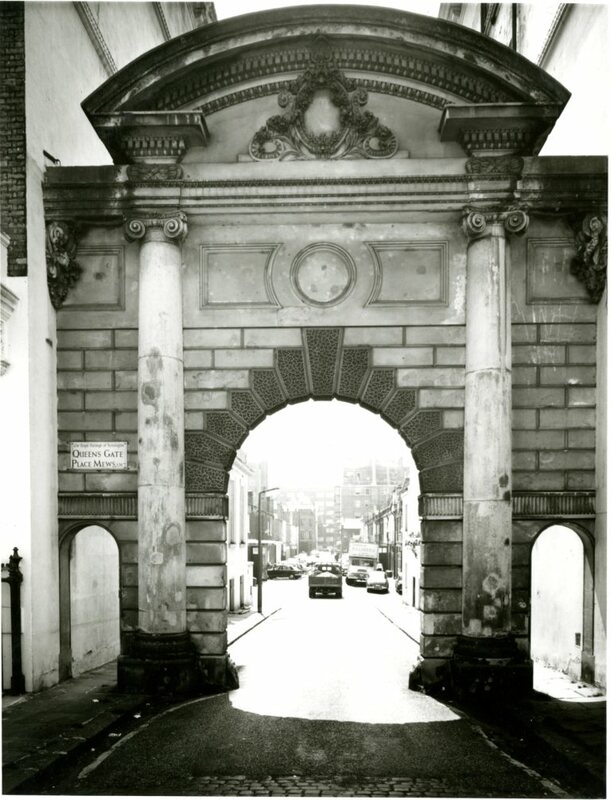 So, it’s with great pleasure that I am able to share with you some photographs that Peter Dixon was kind enough to give us as part of the Local Studies collection. Later on in the postscript I will add a link to the website that shows more of Peter’s work and also how the project came about. I think you will find it of great interest, and is well worth a visit. First, some photographs to pique your interest. 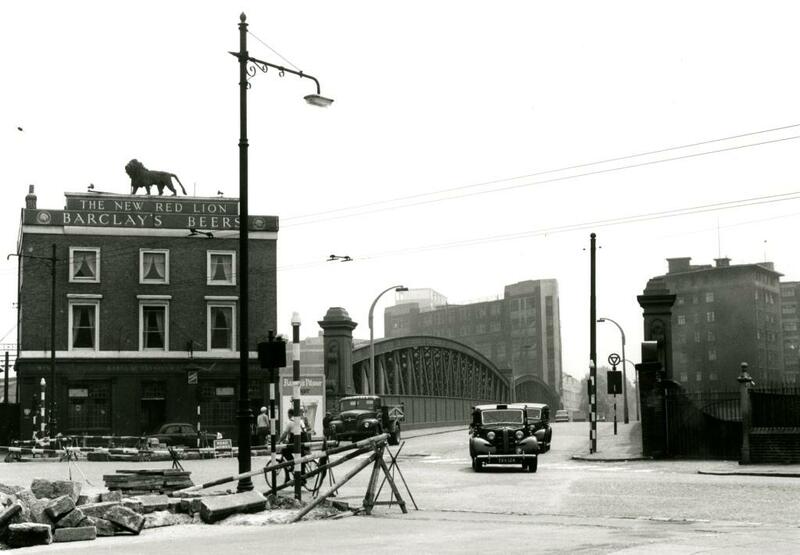 Above is one of my favourite images of the Harrow Road showing the New Red Lion pub. It has that magnificent lion on the top which I imagine must have been red. 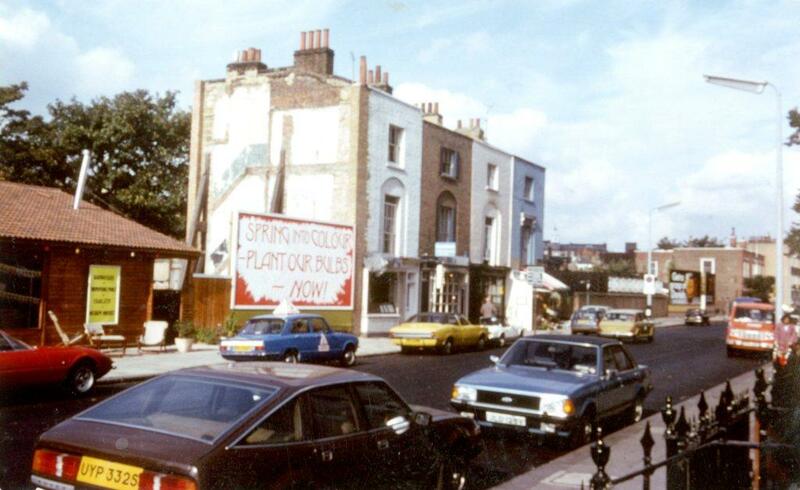 I’m probably stating the obvious, but it was before my time and I never saw it before the pub was demolished. To the right is a billboard advertising lager, just in case you fancied something other than your usual brew. 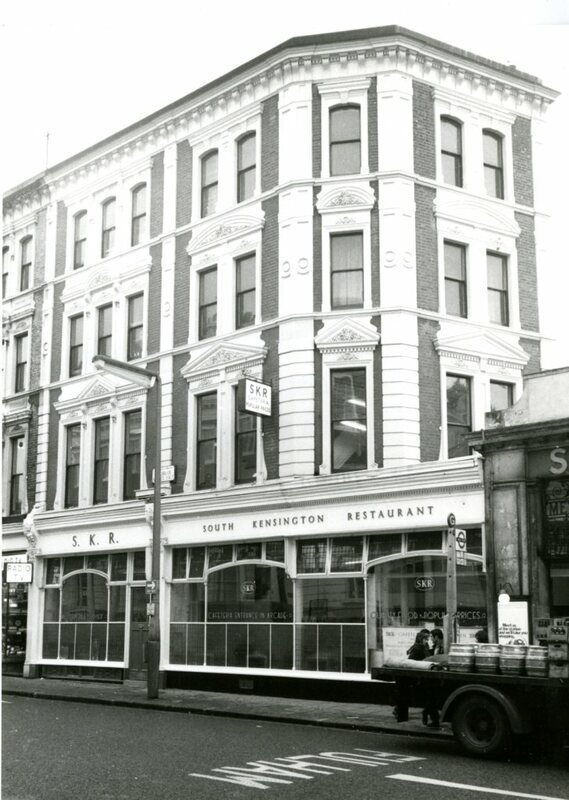 The New Red Lion was one of many pubs in the area, but it is listed in the directories (at least) since 1902. It survived many decades and probably served a good number of those employed by the Great Western Railway. 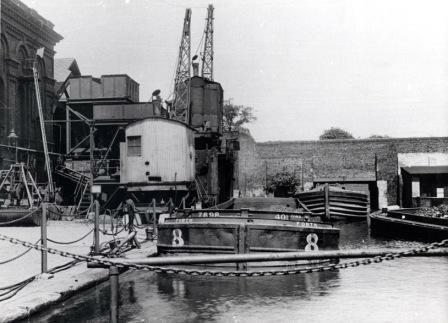 As well as the station there were several wharves, Goods yards, and the Grand Junction Canal. Enough to keep the pub busy with workers enjoying some respite. If alcohol wasn’t to your taste, there might have been the possibility of some milk. 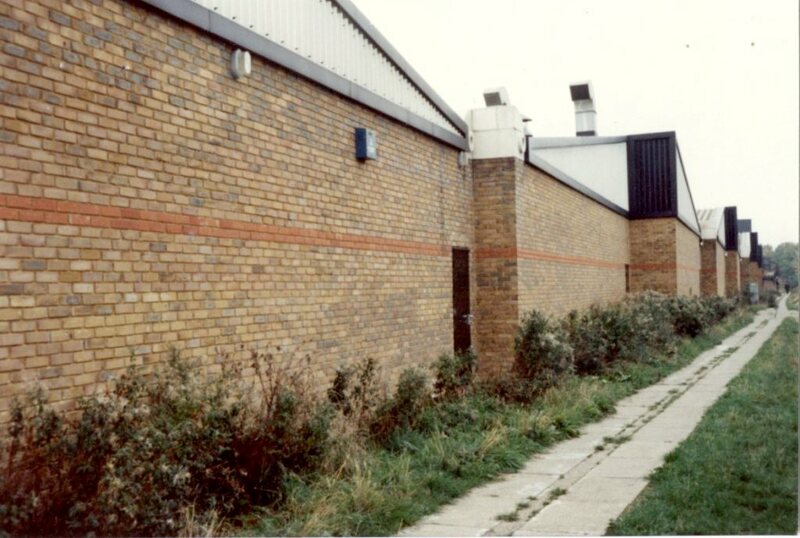 To the right of the Westbourne Bridge, practically next door, there used to exist a number of cattle pens, evidently serving a dairy that must have supplied the local area. 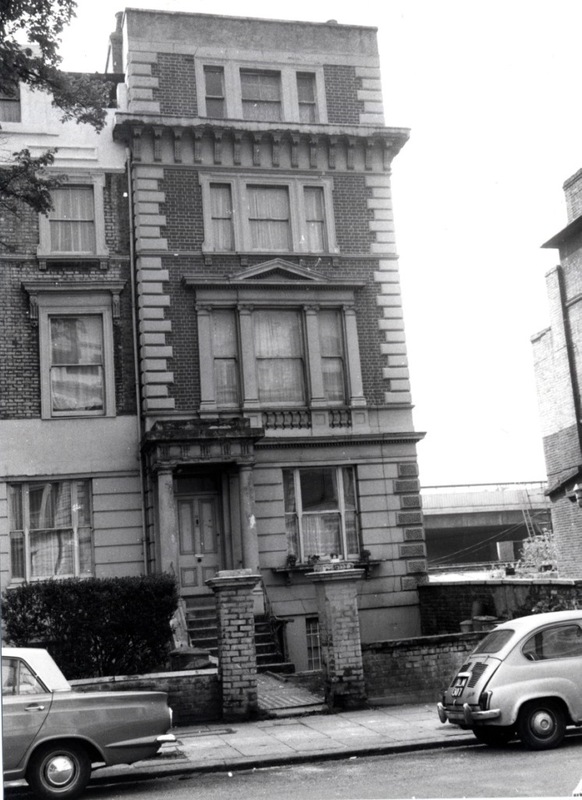 Beyond the Westbourne Bridge was Bishop’s Bridge Road. 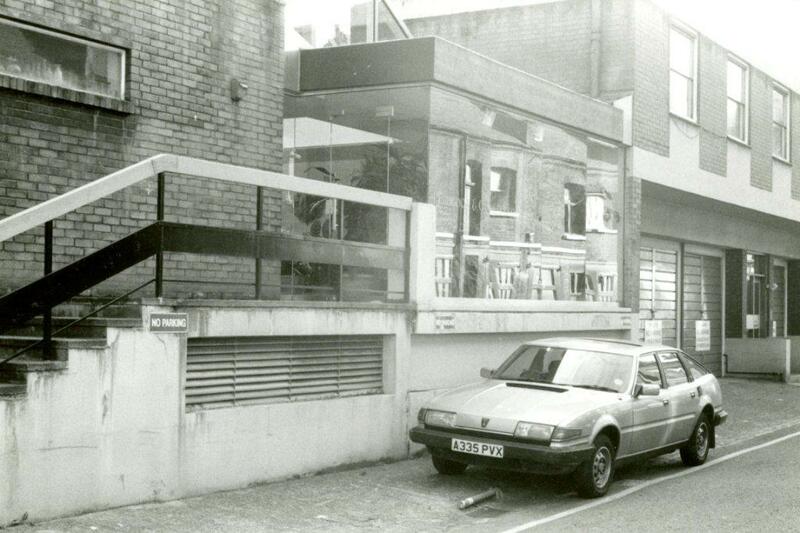 Some of you may remember the Bridge Café. But here I digress. 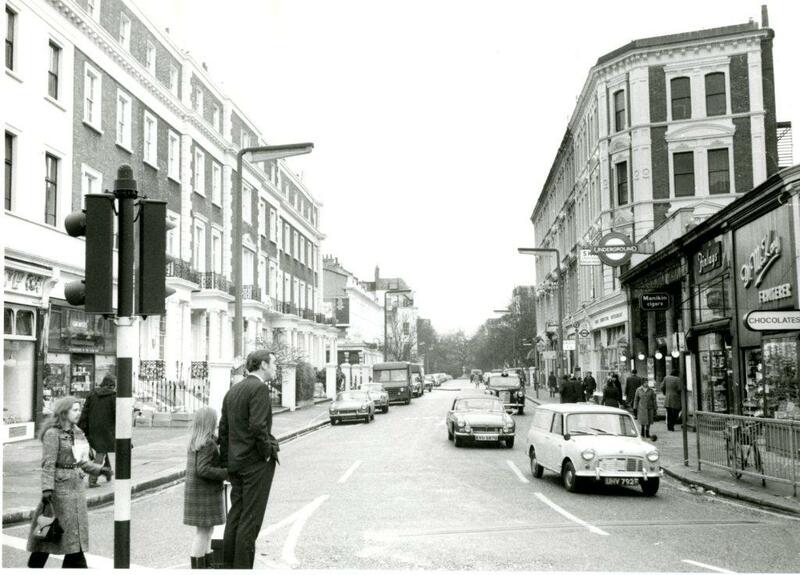 Above Is the junction between Lord Hill’s Road and possibly Westbourne Park Crescent. Familiar territory for those of you following the Paddington blog posts. 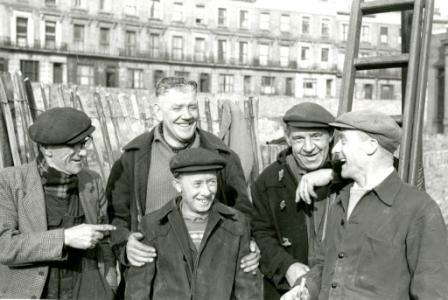 What’s great about the following images is how Peter captured the local people. He was able to snap images of people going about their business or posing. 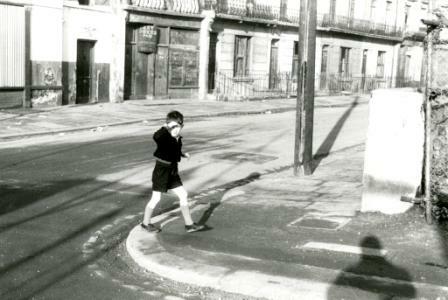 Children, particularly, were often seen playing on the streets. In those days we didn’t have the technology or the means to amuse ourselves with the current plethora of indoor entertainment we have now. We spent more time outdoors, making up our own games. 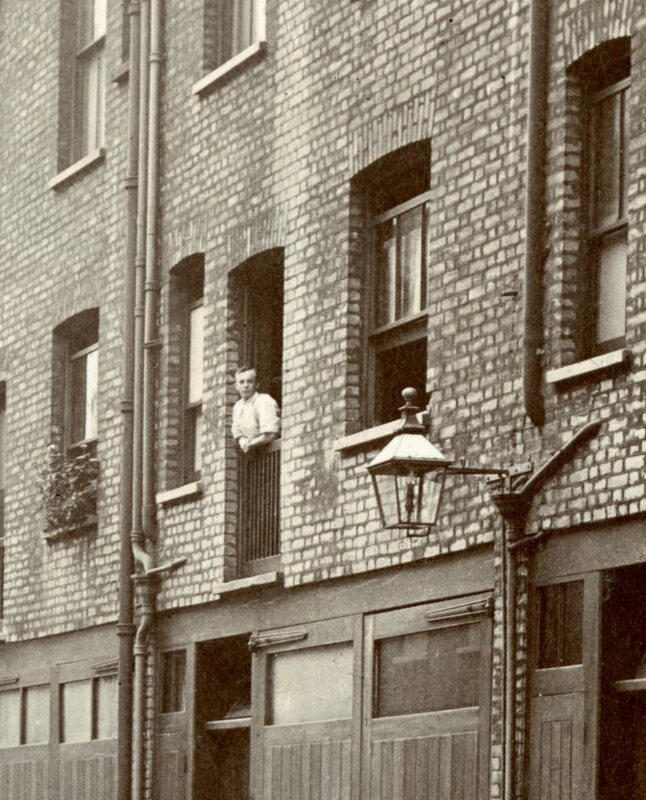 A young lad on his bicycle possibly looking at the strange, if not cheeky, graffiti on the pillar of the house in front of him. Most of the houses in the area at this point were condemned for demolition to make way for the new Warwick Estate. A bonfire burning fiercely to the left of the image. The gentleman in the foreground could be one of the workers in the area burning flammable items (wood perhaps) that might have resulted from the obvious destruction of the old houses once the bulldozers moved in. Safety helmets and formal attire were not compulsory at the time so it’s difficult to say if this was a construction worker, or a local resident. In the background you can just make out the eerie shadows of the new blocks that were going up almost as quickly as the terraces were being demolished. The past and the future, as I have probably mentioned in previous posts, was very marked during this period of redevelopment. It’s not unlike those glass behemoths being built all over London today giving everything a futuristic flavour. St Mary Magdalene to the right, next to what I think was Woodchester Street. 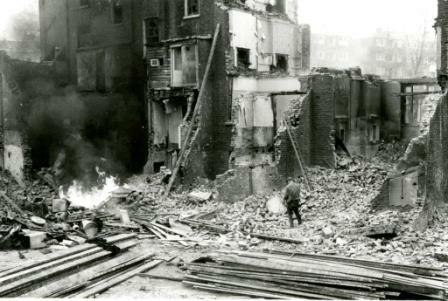 All the existing streets at the time were later demolished, rerouted or renamed. 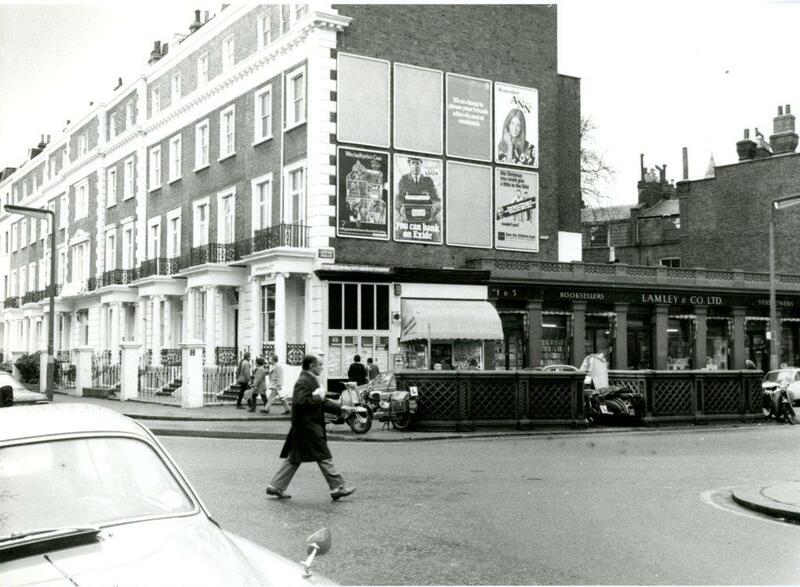 In the background is a tobacconist with the title: The Boar’s Head Tobacco, and a grocery shop: I &S Jones, advertising what looks like, Benedict peas. It would appear the premises were already vacant and no longer serving the local community at this point. There is a large ‘Sold’ sign between the two stores. A young lad squints into the sun as Peter takes the photograph. His shadow visible on the right of the image. 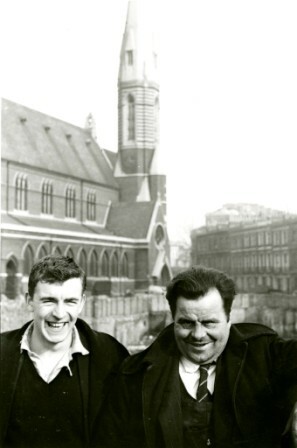 Two chaps smiling at the camera. Peter did say that people were generally very friendly and obliging when asked if they could have their photo taken. It was considered something of a novelty. A really nice candid shot of a group of gentlemen clearly enjoying a joke. 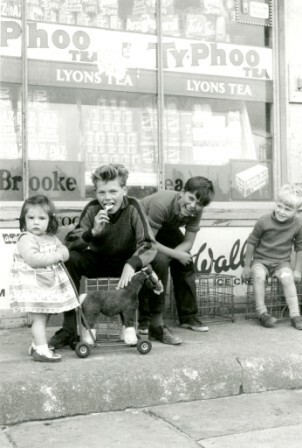 And here’s another wonderful image of some children being candidly themselves sitting outside a convenience store. 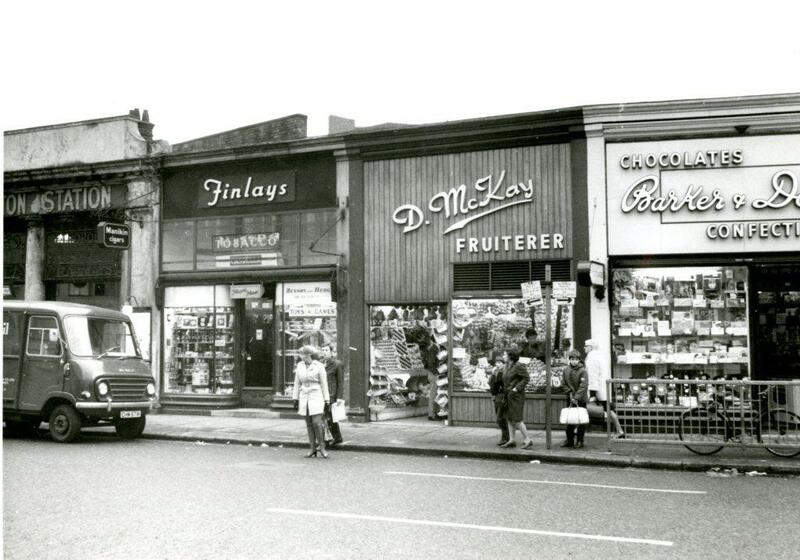 Confectionery of any kind was always considered a real treat and the young lad in the middle is clearly enjoying a lollipop as he poses for the camera. 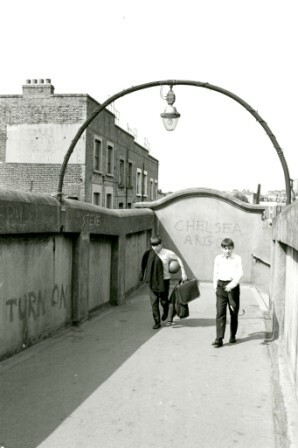 Two boys crossing the footbridge that links Formosa Street with Lord Hill’s Road, separated by the canal. 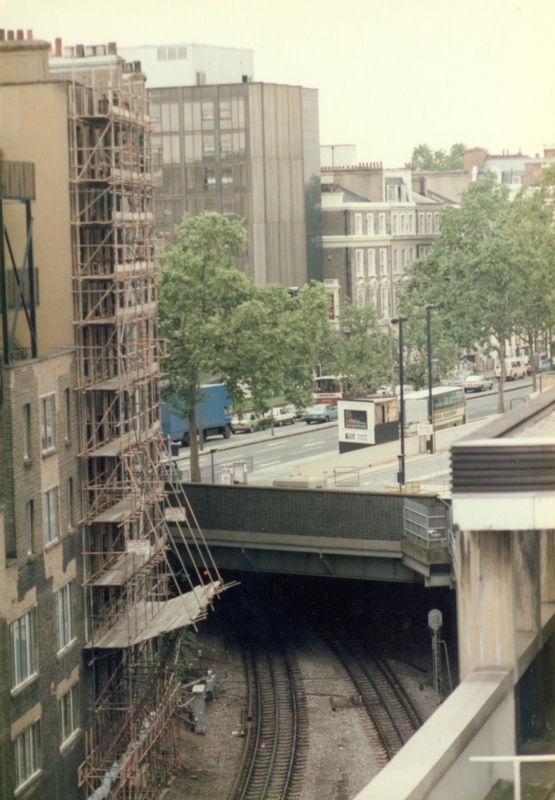 The footbridge no longer exists as you see it here. 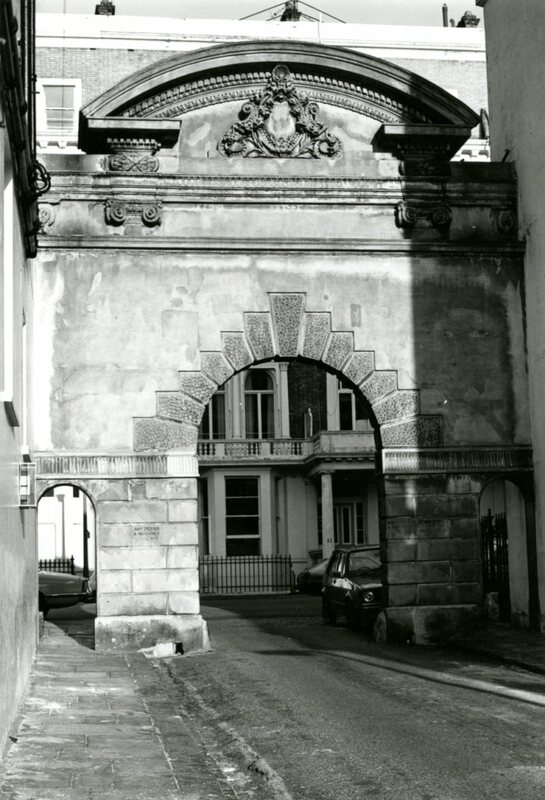 It was originally built by the canal company, taken over by the Metropolitan Board of works, and later conveyed to the vestries. 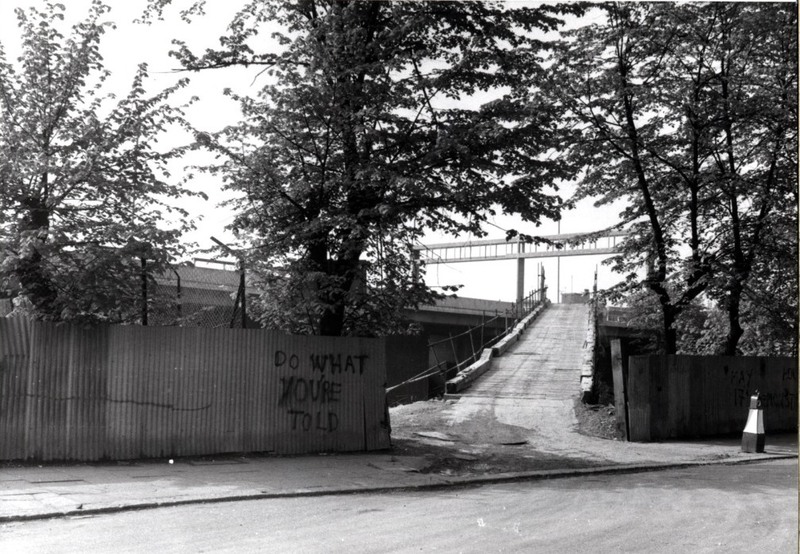 I used to call it the dodgy bridge. It always seemed so destitute and neglected. Every time it was newly painted, it wasn’t long before the graffiti would leave its mark and time would strip away its freshness. 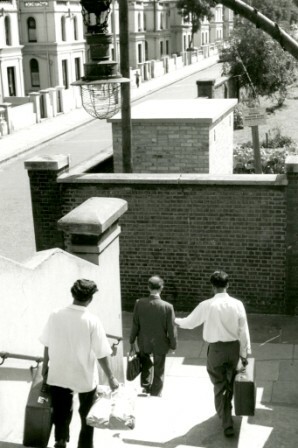 I used this footbridge frequently whenever I walked towards, Warwick Avenue, Maida Vale or to the library in Sutherland Avenue. 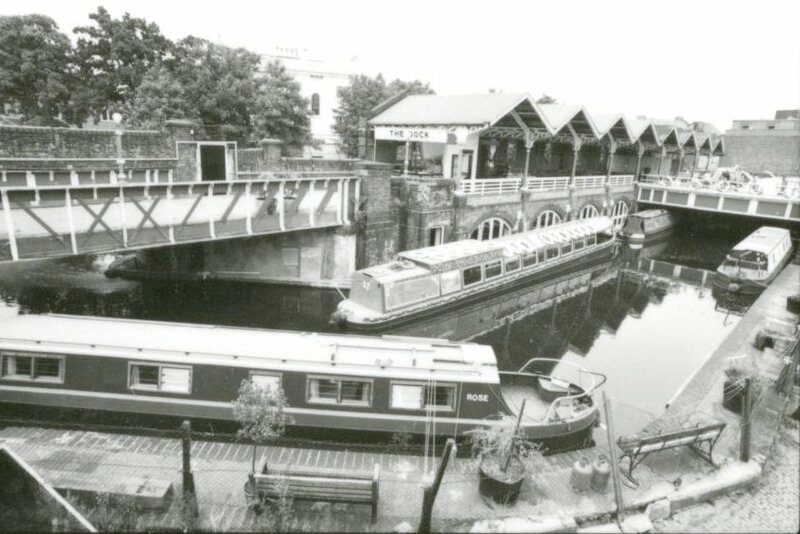 It was replaced in the 1980’s, perhaps early 1990’s (if I remember correctly) by a far nicer, more open footbridge that has a better view of the canal and the surrounding area. 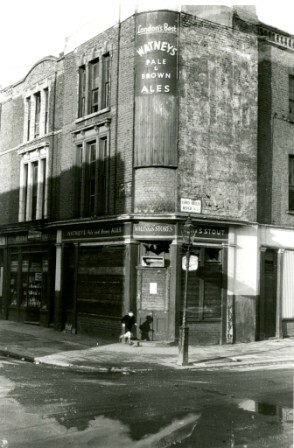 The Paddington Stop pub as I remember it (now a gastro pub called The Waterway) was on the corner, and all the wharves that existed opposite Clarendon Street over the canal were all eventually pulled down and the area became residential with the Amberley Estate built as part of the redevelopment of the area. The bridge with the canal and Delamere Terrace in view. 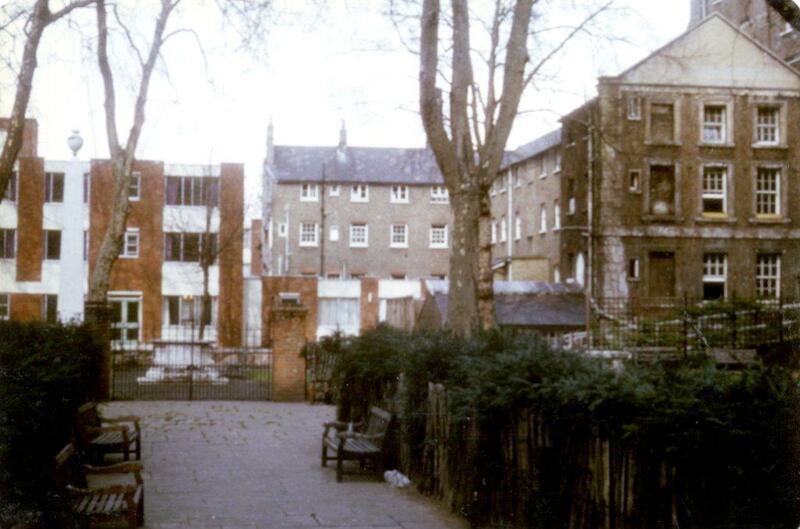 The terraces you see were subsequently demolished and replaced by the flats you still see today as part of the Warwick Estate. The lady in the image appears to have, what looks like, a wash bag with her. Not an uncommon sight at the time. The luxury of having a washing machine is a relatively modern concept. 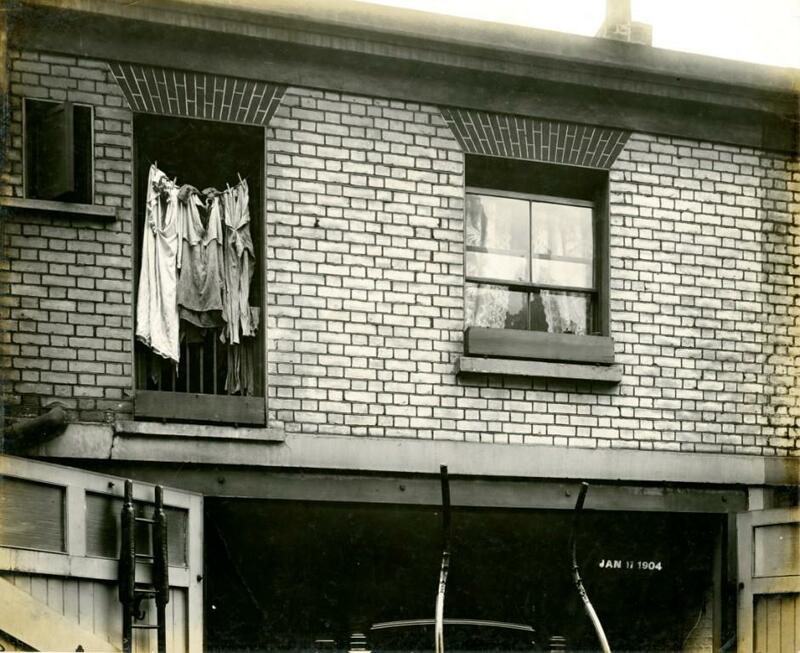 I distinctly remember in my early years my mum taking our laundry, with us in tow, to the local launderette on the Harrow Road. 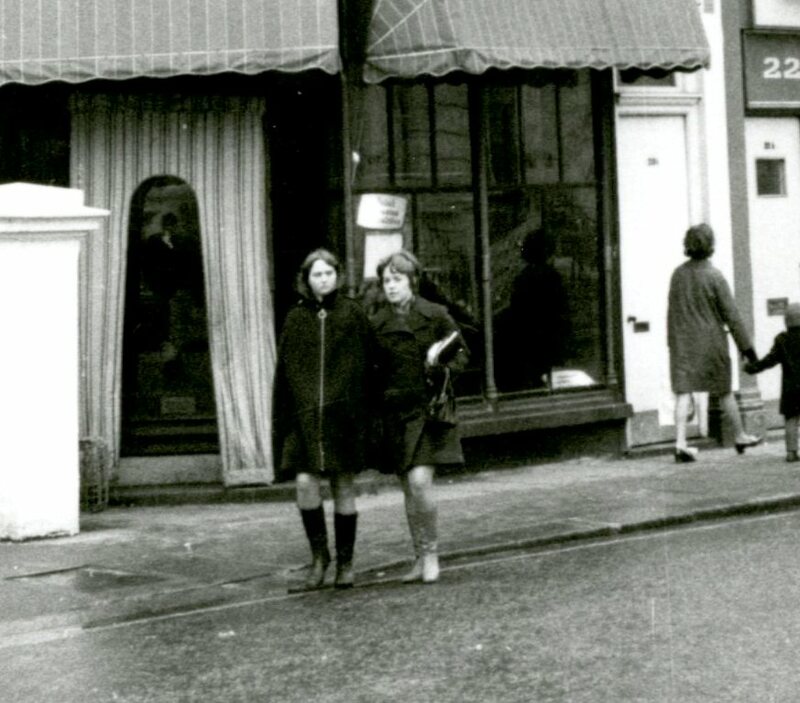 It was next door to the off-licence, just before Cirencester Street. The interminable waiting for the washing cycle to end rendered me bored most of the time, so I would often have a library book with me to ease my impatience. The same side of the bridge. 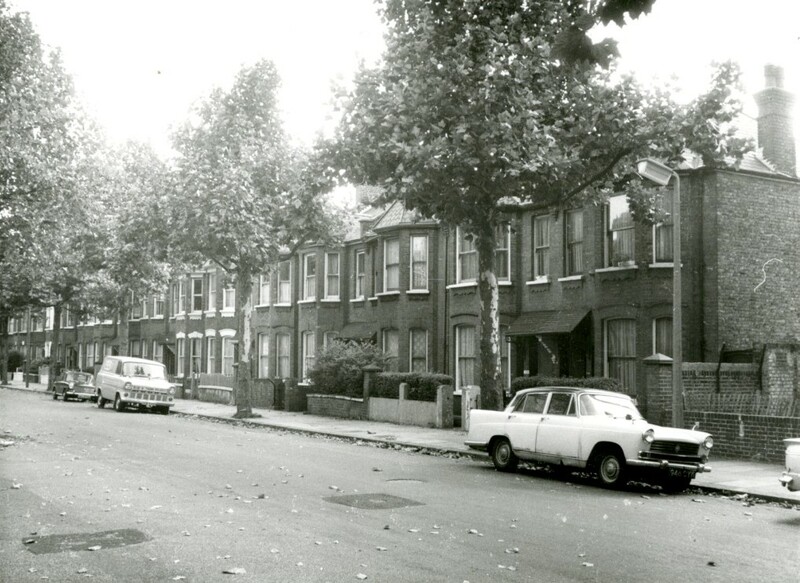 Only here we see Blomfield Road where the difference in housing was evident. The villas that still exist along this side of the canal were a marked contrast to the terraces opposite. We always remarked on this distinction. 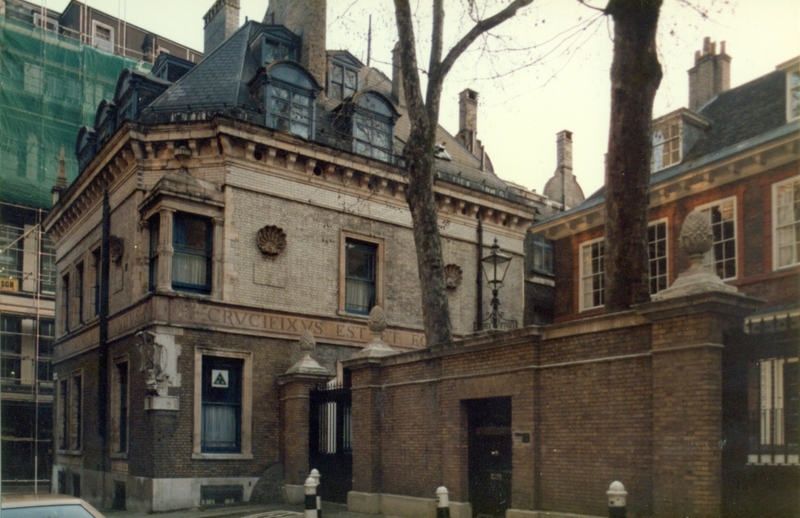 ‘Posh people’ lived here! Perhaps these gentlemen were moving in? 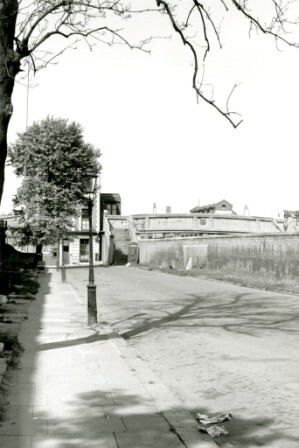 A fantastic photograph taken from Delamere Terrace showing the wall that divided the street from the canal. The footbridge was flanked by a house, and at the foot of the stairs you can see a slightly leaning telephone box that seems, in my fanciful mind, like it doesn’t want to be there. 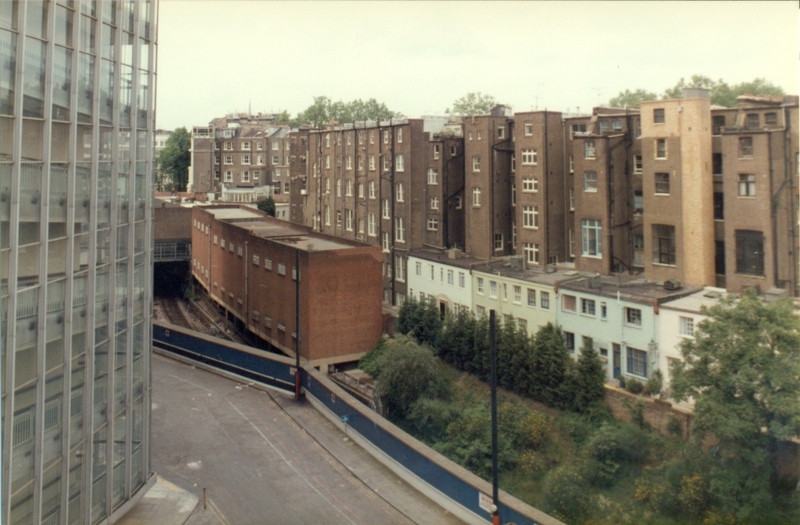 The leaning phone box of Paddington was not there when I moved in, but neither was most of what you see in this image. Railings had replaced the wall. The roads were resurfaced and newly paved. Even the trees and lampposts were replaced. 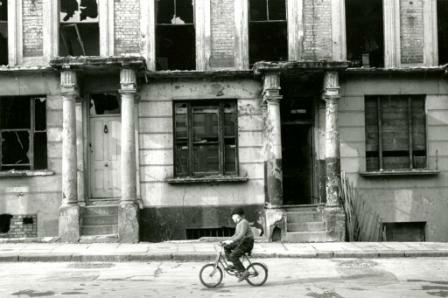 It wasn’t just the buildings that went, but much of what furnished the rest of the streets too. 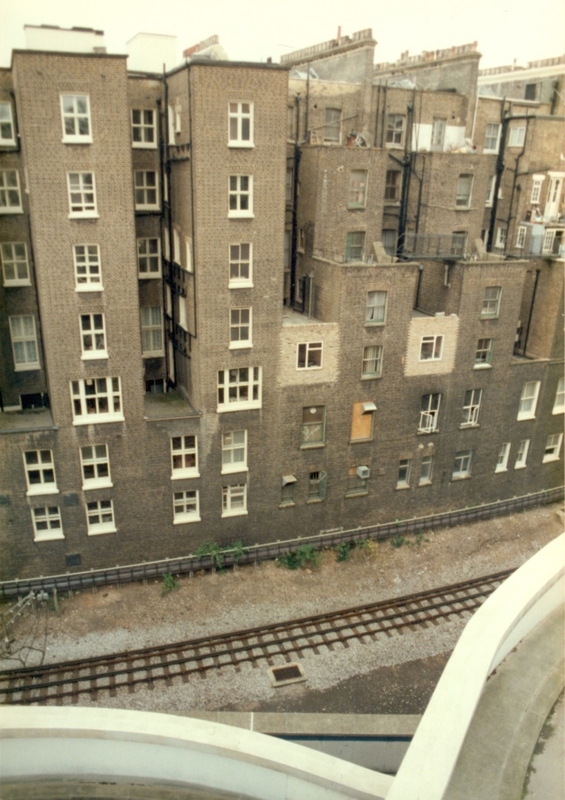 This is another favourite of Peter Dixon’s Paddington photographs that I think summarises this particular area nicely. One to end this post on. He took this in 1964 – a few years after he first started photographing the area. 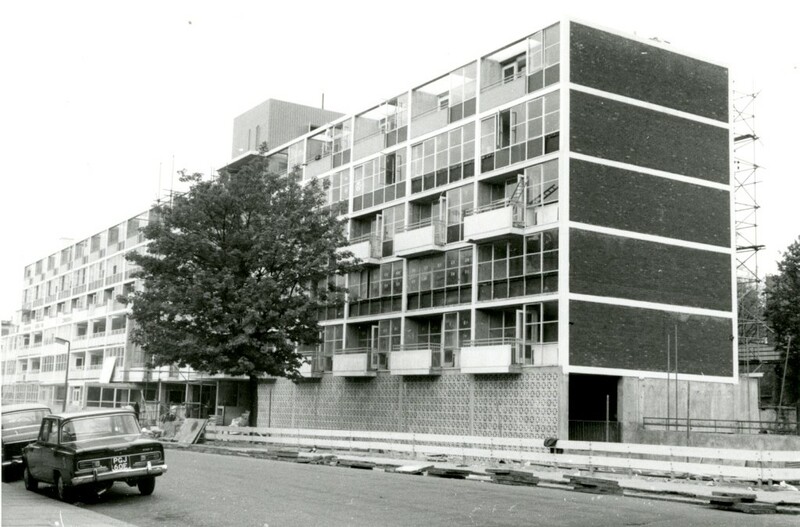 By this time a lot of the new flats had been built and the tower blocks were going up. The Warwick Estate, with the elegant St Mary Magdalene as its centre piece, was nearing completion. A few new blocks were still to be insinuated into the fabric of the LCC plan, but it was almost done. The area was opened up and became less crowded. 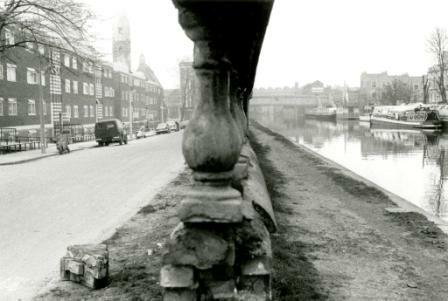 The wall by the canal was taken down and eventually replaced with railings. The canal sidewalk would be paved and made more accessible to the general public. And yet…in the foggy distance to the right, the buildings of old were still awaiting their fate. 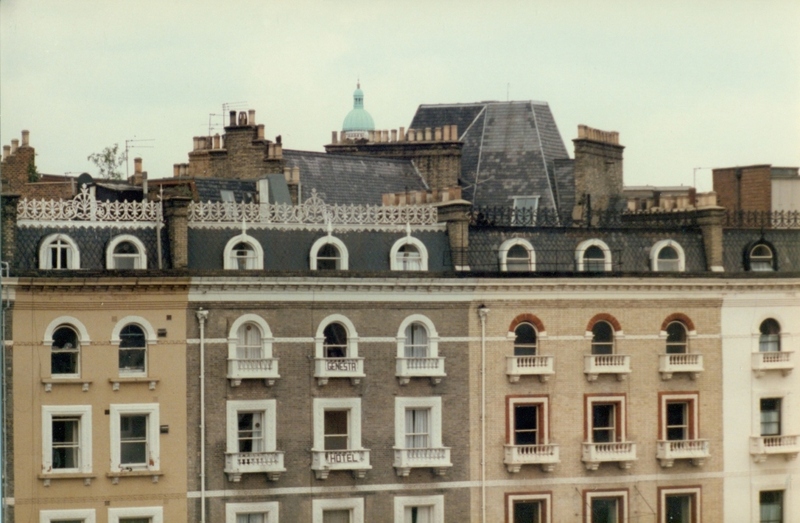 As with all the photographs I have talked about in the Paddington blogs, the juxtaposition between the old and the new is stark. Interestingly, to the right of the image you can see a canal boat. Nothing unusual. 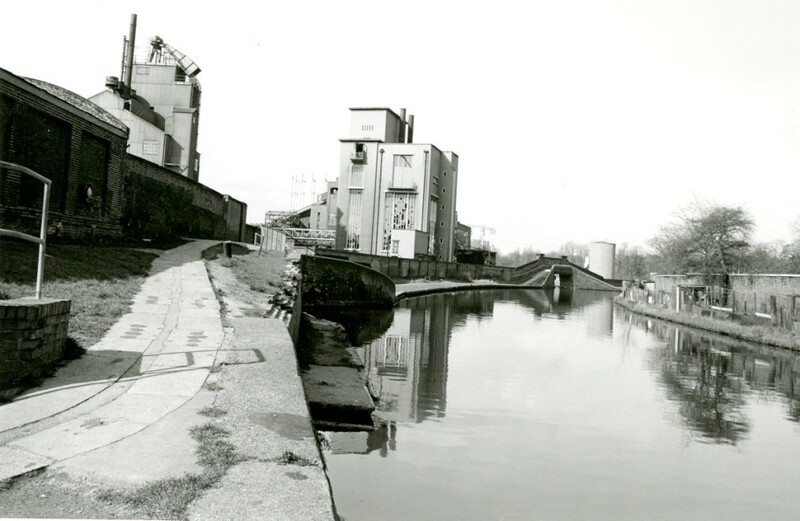 The canal was always a working waterway, used to transport goods and sometimes passengers. 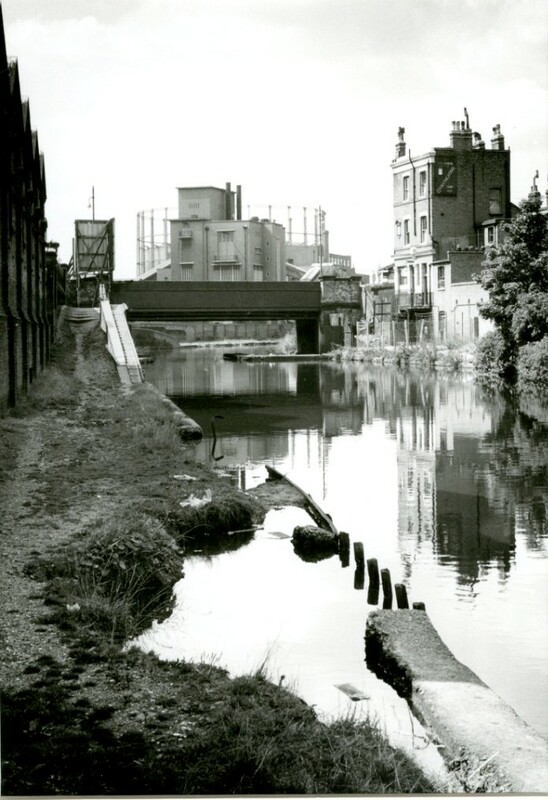 But with the decline of the canal transport industry and the deteriorating condition of the waterways beginning to show, it was the leisure industry that helped to revive interest in the canals. 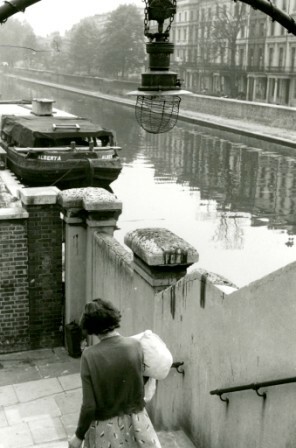 Although the pool at Little Venice was always intended for pleasure boats, there was no obvious leisure service. 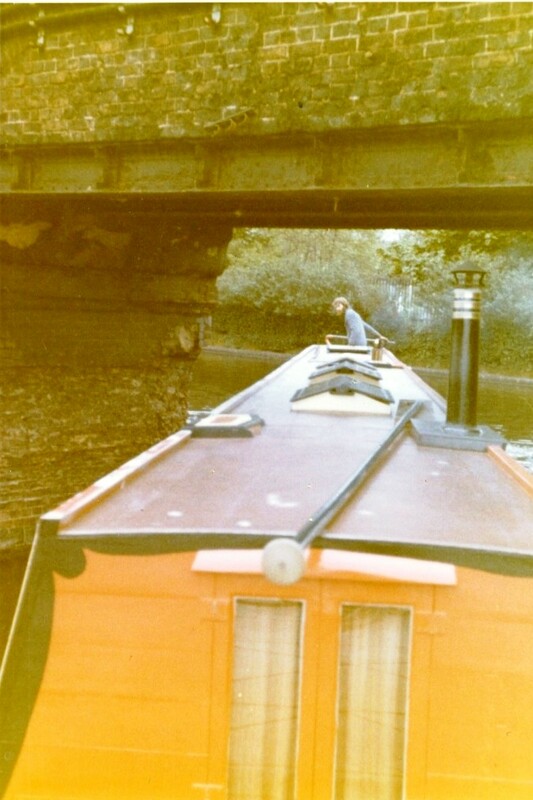 Summer excursions from Little Venice to Camden Town, was really only just started in 1951 by John James. That’s his boat in the background. The company still exists to this day. 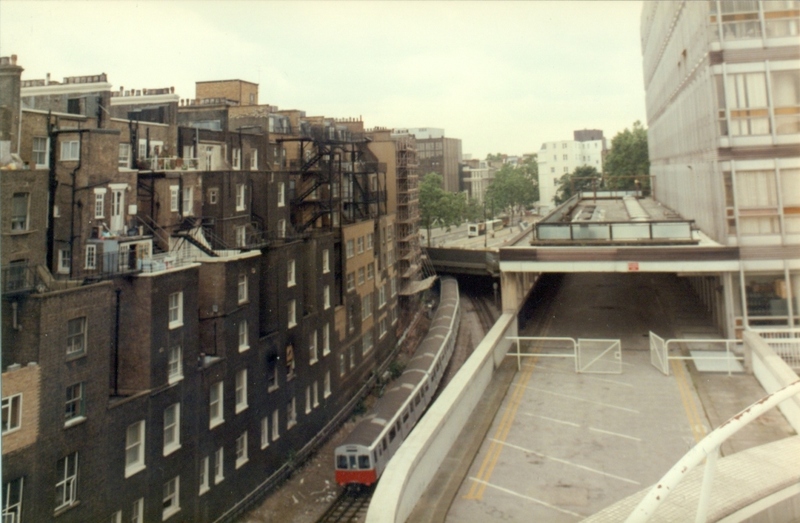 I remember a number of trips to London Zoo in Regents Park from here and the echoing tunnels as we passed through. Fond memories of a long ago childhood. I hope you have enjoyed revisiting this part of Paddington again. I have been reading all your comments and reminiscences from previous posts with interest, and realise just how many stories there are to tell. 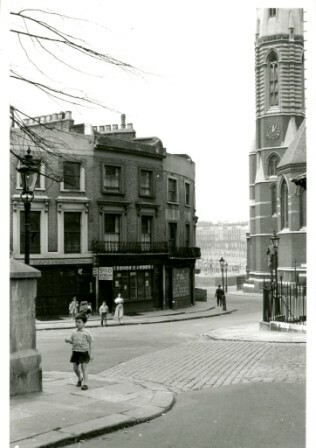 With this in mind I would like to tell you about the St Mary Magdalene’s website which references an oral history project that is collecting stories about north Paddington from anyone who wishes to contribute. George Kambouroglou is the heritage officer working on this oral history project as part of the St Mary Mags church development. 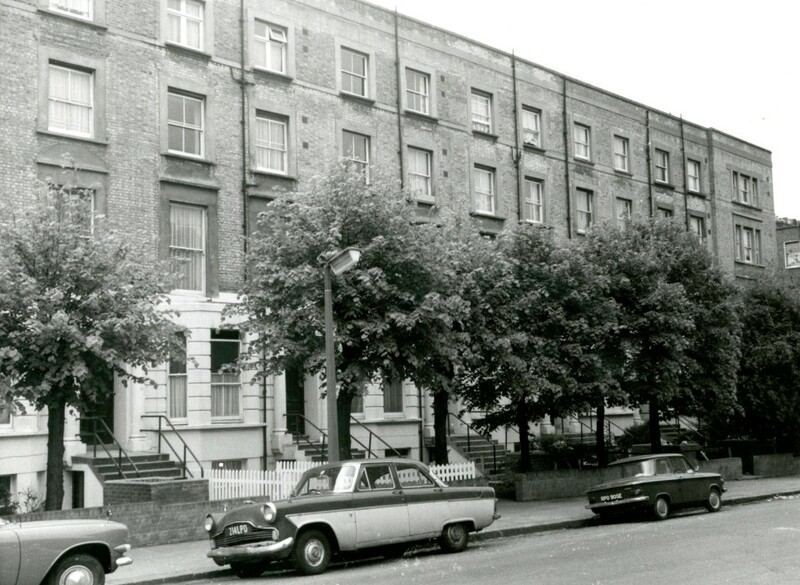 The oral history project looks at historic north Paddington and the surrounding area. So if anyone is interested in contributing their memories, please contact him directly at George@pdt.org.uk . The content of this post arises from the use of an occasional method of mine to stimulate inspiration. Start scanning with one picture you like and keep going until a theme emerges. I don’t know if it always work. 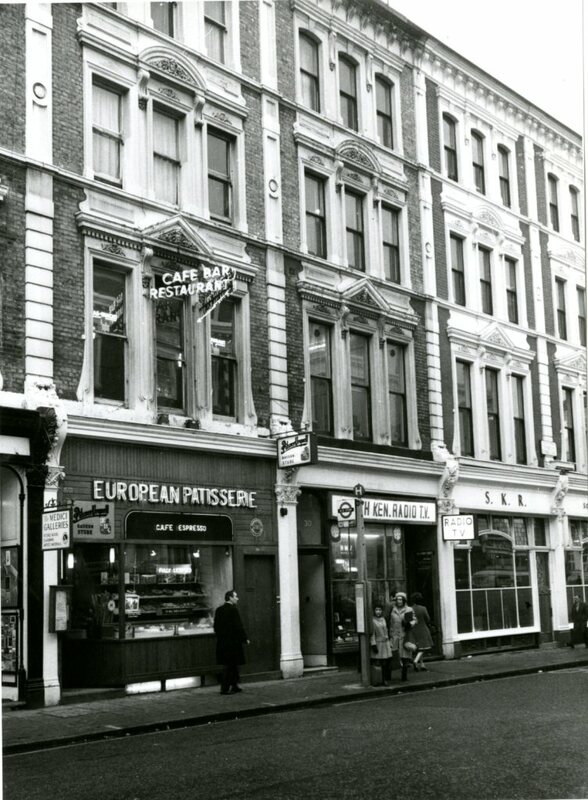 For some reason probably to do with my teenage ideas about what London was like and my deep-seated desire to live there I was very taken with this picture. 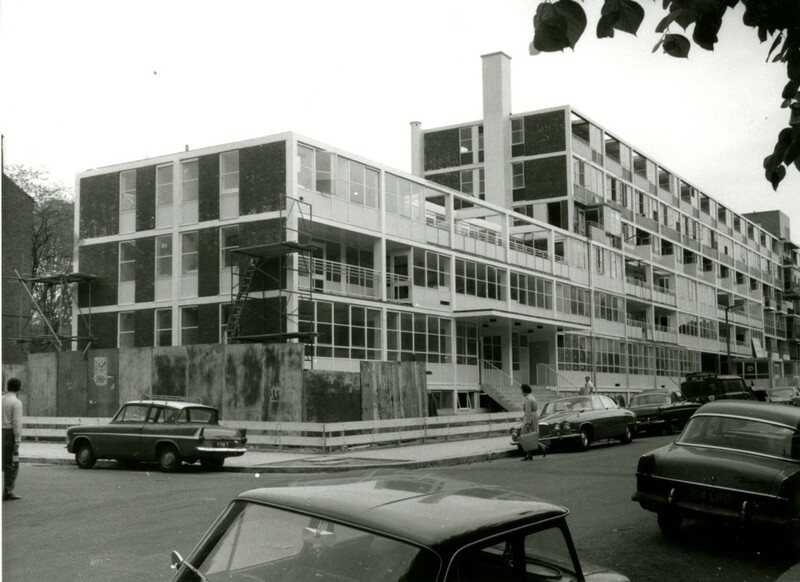 Possibly it was because this block of “new flats”, as John Rogers calls them, in Oxford Gardens struck me as a distinctly 1960s design, light, airy, optimistic and modern in a street dominated by 19th century suburban villas. I have a weakness for these anonymous boxes which can be found all over Europe. It looks a bit like a student hall of residence. The old style houses have their own charms of course. 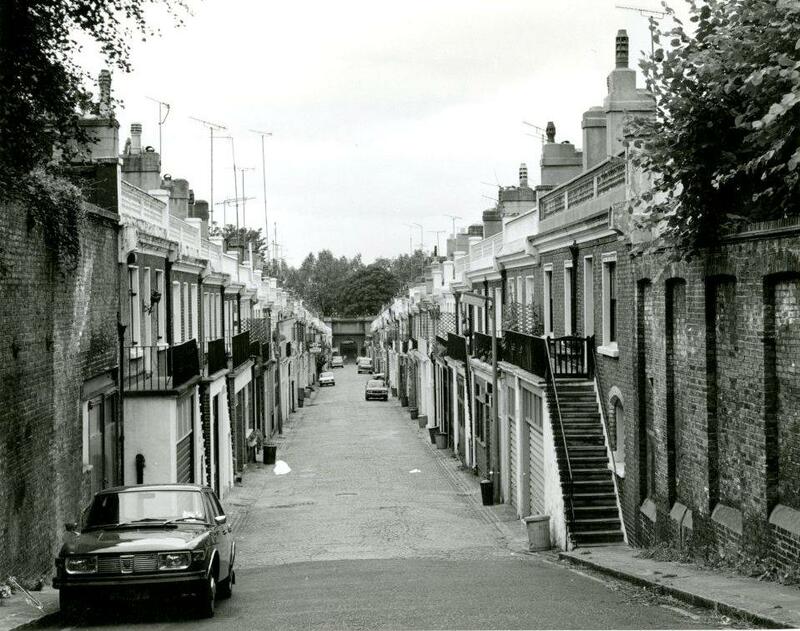 The mid-Victorian terrace is another trope of London living in the late 60s and early 70s. Characters in sit-coms and modern dramas lived in them. Pleasant tree lined avenues, a bit windswept, plenty of fallen leaves and a scattering of rough looking British cars. I know I’ve already implied in the title that there’s going to be some car identification in this post (that was the “theme” which emerged) , but the truth is I’m not that strong on British cars of this era, so I’m going to have to rely on the car aficionados among my readers to do most of the actual spotting. I just know when I see something interesting. Now that chunky two-tone monster has got to be something good. It looks like it could swallow the Hillman Imp (?) behind it, maintaining a safe distance from the big-eyed creature. The two cars below look a little exotic. Is that a Volvo? The sporty one I mean. The one I’m not so sure of, but that grille feature on the side looks familiar somehow. I feel I should know it. 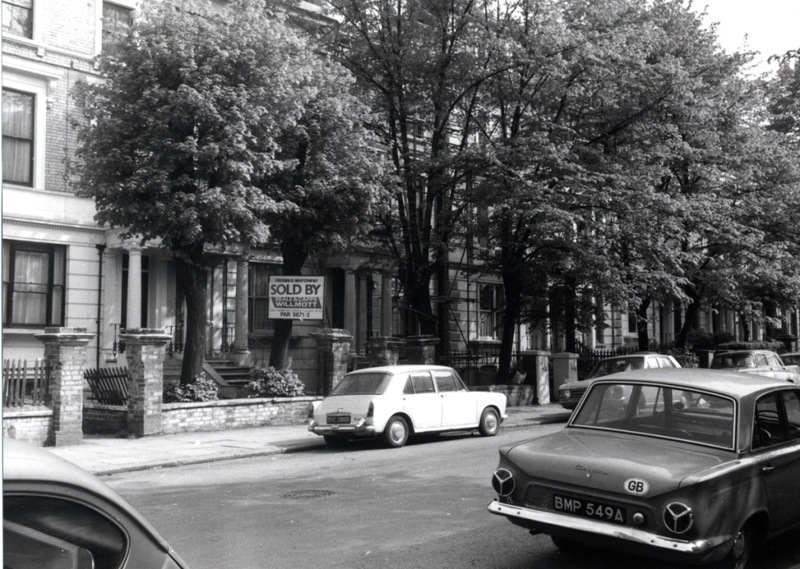 Here’s a Cortina in Cambridge Gardens. The fairly distinctive rear end of the Mark 1. When I was young you knew that the GB sign meant that the car had been abroad, cruising along continental roads. An Austin Something in the background. Some of the houses look a little dilapidated, awaiting the coming tide of gentrification. 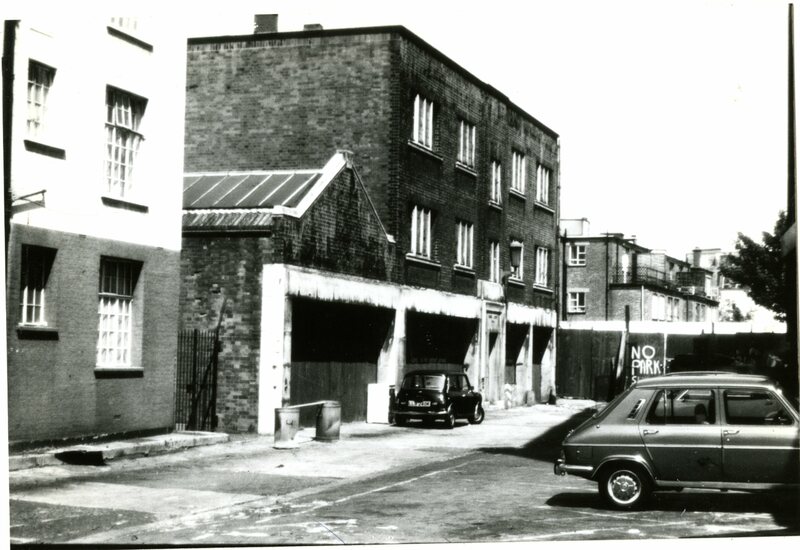 A Fiat on the right, and between the houses a glimpse of the Westway, or the Western Avenue Extention as it was sometimes referred to at the time. You can see it again here. Some characteristic graffiti late 60s by the entrance to an access point for builders and other workers . 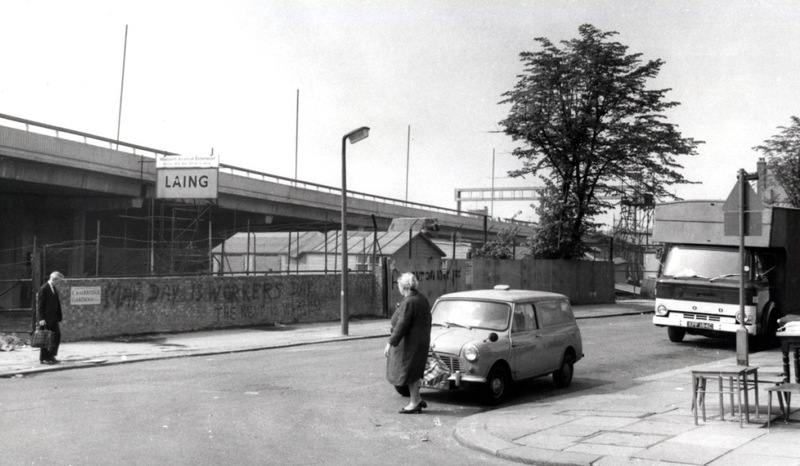 Above some indistinct graffiti you can see a sign for Laing, the giant construction company which built the Westway. We used some pictures which originated with the company in a few earlier posts. (A typical one) We have many more, and may come back to them again this year. But back to cars. Here’s a crowd of them, further down the road. Is that a Triumph in the foreground? 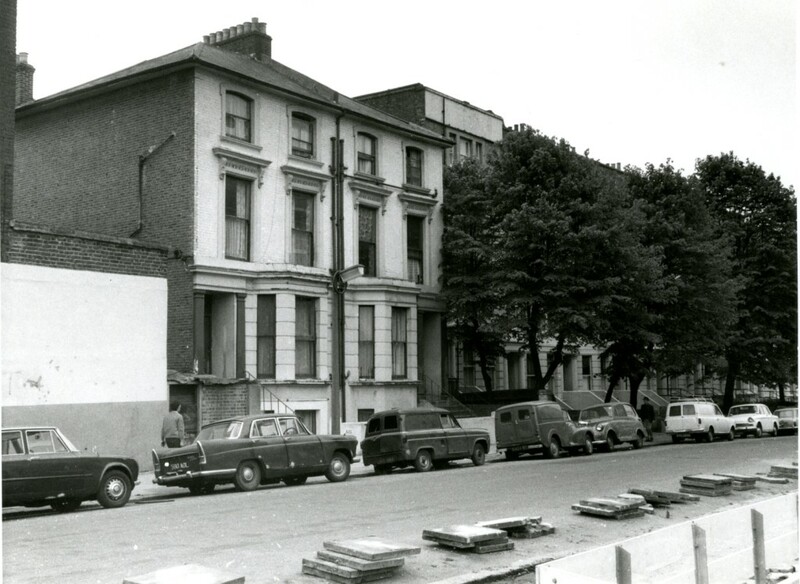 A line of parked cars back in 1969/1970/1971 is always interesting, to me at least. In recent times parked vehicles have become an obstruction for the wandering photographer, as I’ve found many times when looking for equivalent scenes to the ones in our photo survey. 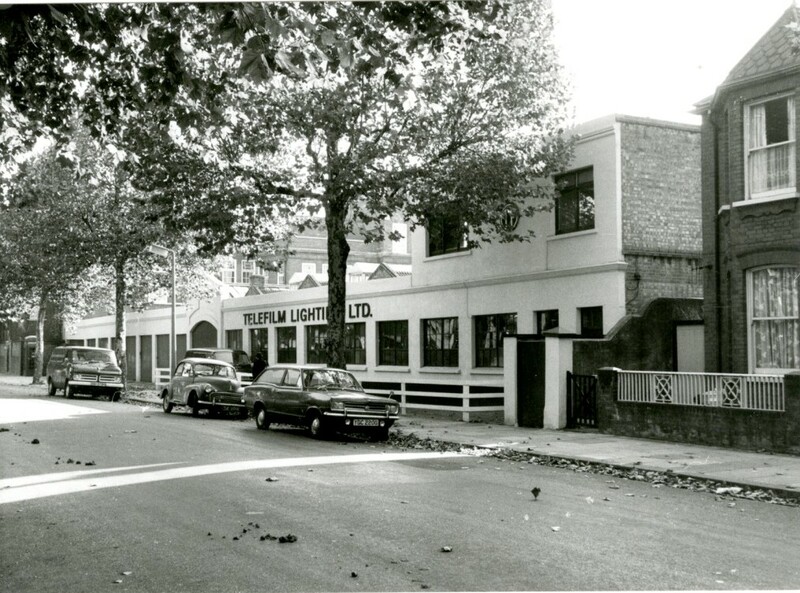 There are other sights from the era , such as this low-slung light industrial building, which is still there today. Or of course the occasional pedestrian. A different Cortina, with some pedestrians worth zooming in on. Despite the unlikeliness of one of these people seeing this post, such things have happened, so if one of them is you , or you know who they are, please leave a comment. In any set of photos there are always people you wonder about. That also applies to the cars. 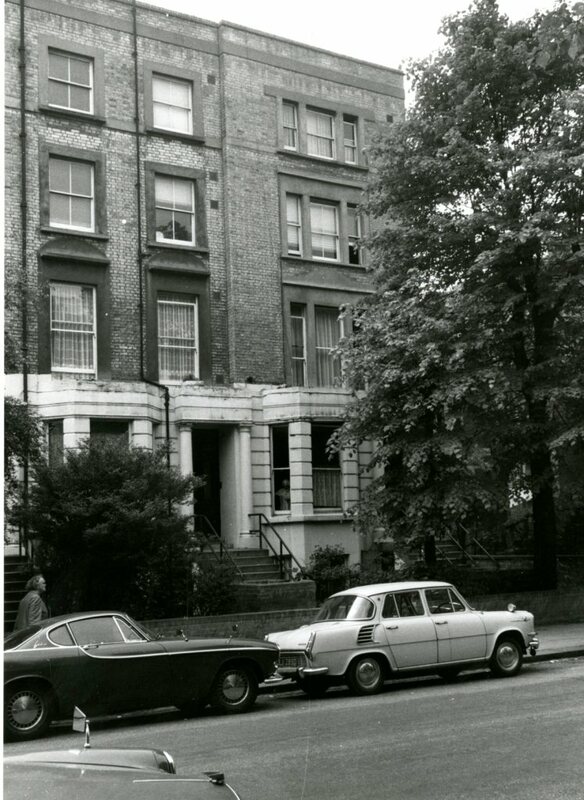 In one of my recent posts about Kensal Road, a reader spotted his father’s Studebaker, which I found very pleasing. Finally, back to where we started. 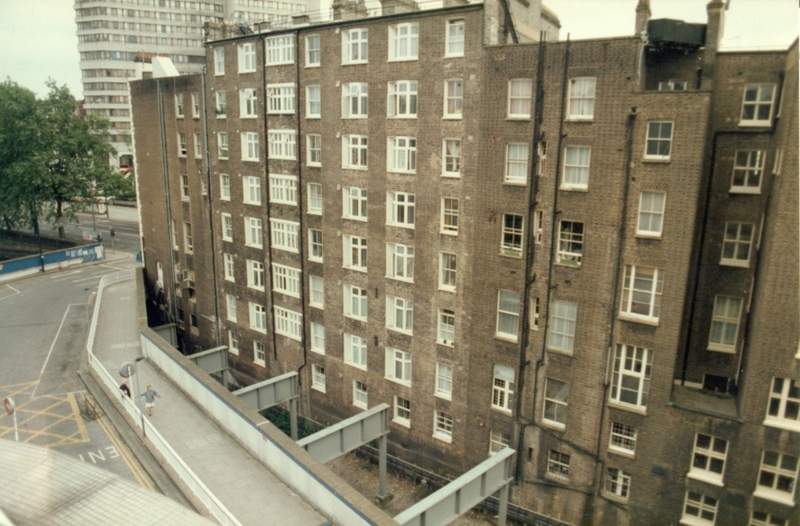 The “new flats”, which are not so new these days but do look more colourful in this century. And another line of cars for identification. I’ve jumped about this week so sorry for that and also for giving out identification work and expecting wiser heads to fill in the gaps in my knowledge but as is often the case, the cars stick out for me when looking at pictures from this era. On the subject of cars here is another question. 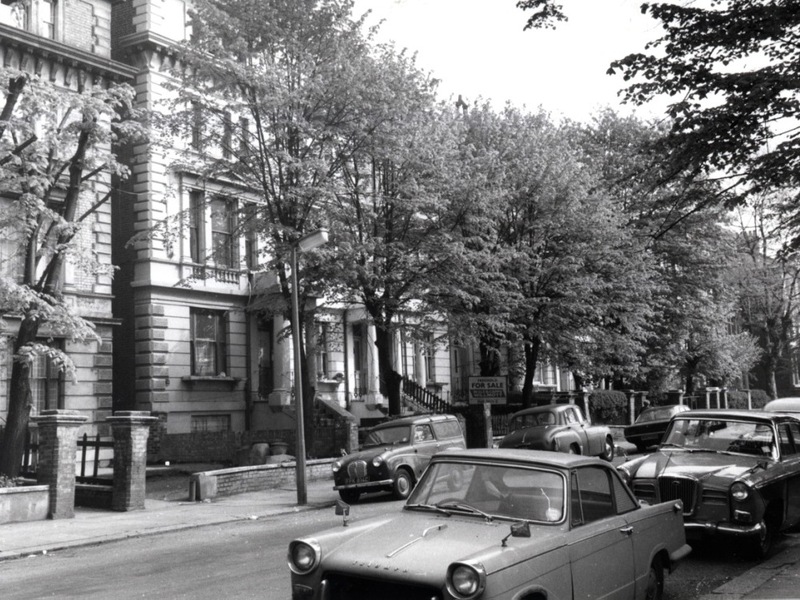 I think I’ve mentioned before that around the late 1970s, somewhere off Dalgarno Gardens (I think) there was a small street which was filled with old Jaguars, which must have been someone’s collection. Does anyone remember this, or are there any photographs? I’m sure I haven’t imagined it. Having had nothing to report at the end of the last post in the way of the deaths of people I liked, since the last post a fortnight ago (I gave myself Easter off as I was mostly at home) we have had two deaths in the world of crime fiction. Philip Kerr was the author of many books but is mainly remembered for the Bernie Gunther series, following a Berlin detective through WW2 and into the Cold war. Although he lived far from the usual haunts of hard boiled detectives, Gunther was a true noir character (although far more ambiguous in his moral code than any Chandler or Hammett hero). If you haven’t read any of the books, I envy you because you now have the chance to read them in chronological order – one of the challenges for Gunter fans was where and when Gunter would start each story. (I see there is some disagreement on this point though, so follow your own instincts) Kerr also wrote three entertaining thrillers in which a football manager solved crimes, surely a first for the genre. His death at what I consider to be a young age is a great loss. If that wasn’t bad enough, Stephen Bochco, writer, producer and showrunner of many American television crime shows has also passed away. Hill Street Blues was a genuinely innovative show which has influenced a huge number of TV programmes in many genres over the years, and I remember watching each episode avidly in the days before binge-watching. For me and others his masterpiece is NYPD Blue, 12 seasons of police work in one New York precinct in the 1990s, when New York’s mean streets were very mean. It was fascinating to watch the secondary lead character, Detective Andy Sipowicz, become the hero as he made a journey from personal disasters and tragedies to some kind of redemption, contending with his own shortcomings as well as major and minor crimes. The next couple of posts arise from this photograph, which my friend Maggie got excited about a couple of weeks ago. (There aren’t too many pictures of this building.) 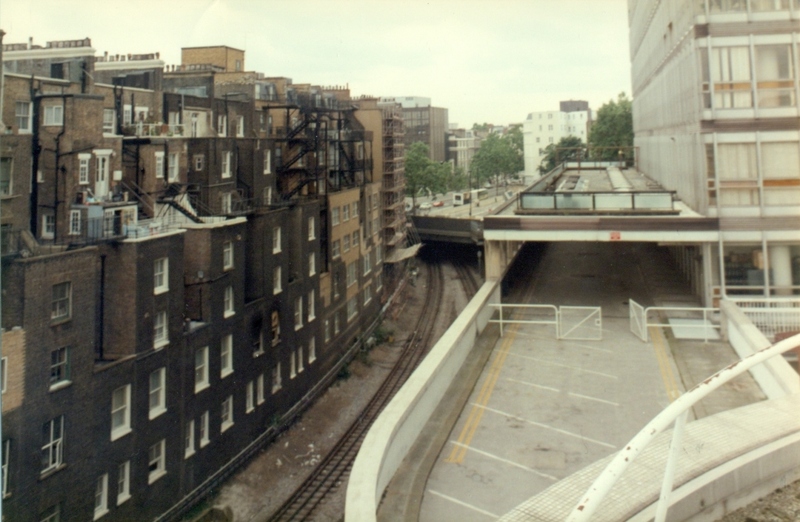 This one comes from our collection of former Planning photos and was taken on October 16th 1984. You can see the staple in the middle which joins two prints together, as we used to do before we could get help from a computer. 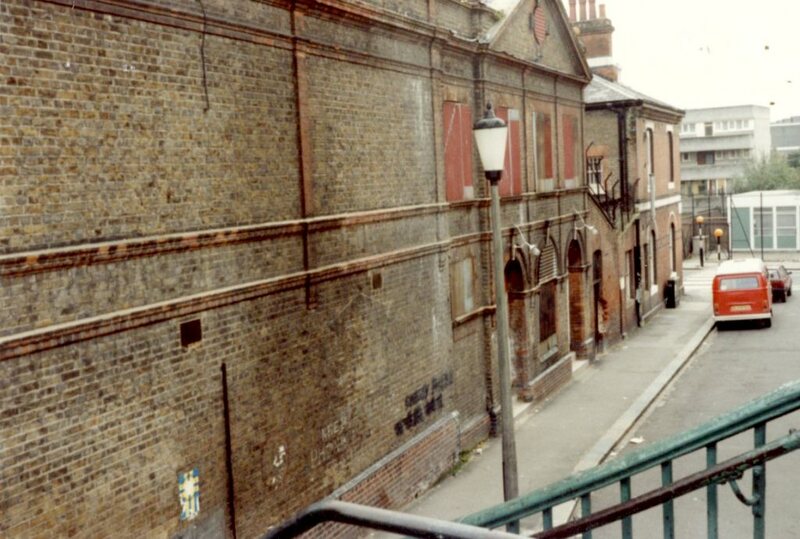 It shows the rear of the former public baths in Kensal Road which backed onto the Grand Union Canal. (Previously known as the Grand Junction Canal) Two faded lines of graffiti seem to read “Save our baths“.Too late perhaps. The impressive building must have been close to demolition given the date . 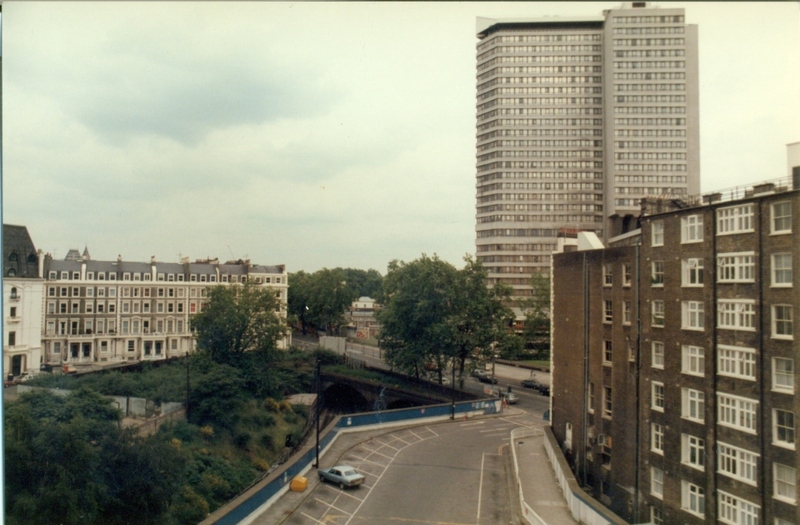 You can see Trellick Tower in the background to give you some idea of the location. The highlighted graffiti reads “An eye for an eye – in the end the whole world goes blind.” A characteristically seventies bit of instant sloganeering. See this old post about graffiti. 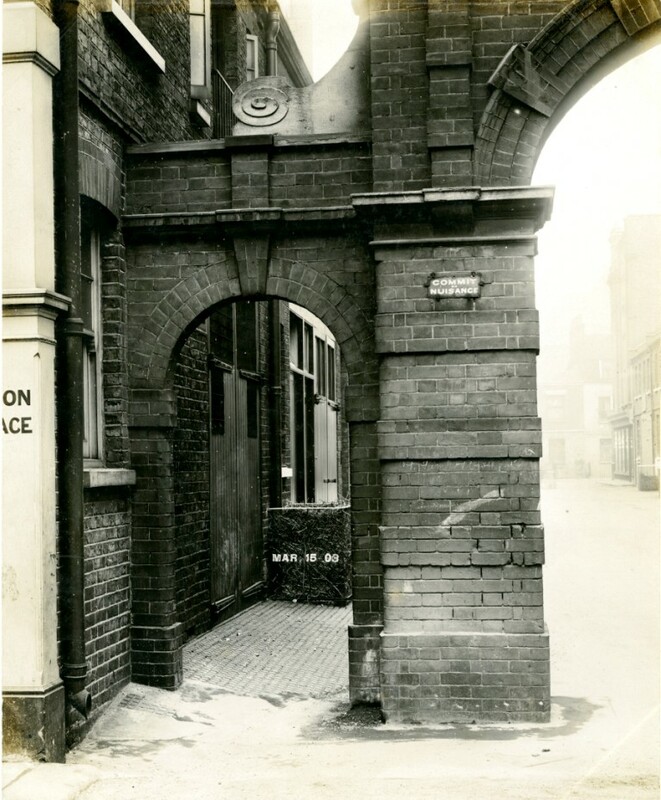 This picture shows the steps up to the bridge, and the main entrance to the baths in Wedlake Street (the baths were sometimes called the Wedlake Baths). No amount of peering with a magnifying glass (another piece of old tech used in local studies) will reveal the wording text of the graffiti. 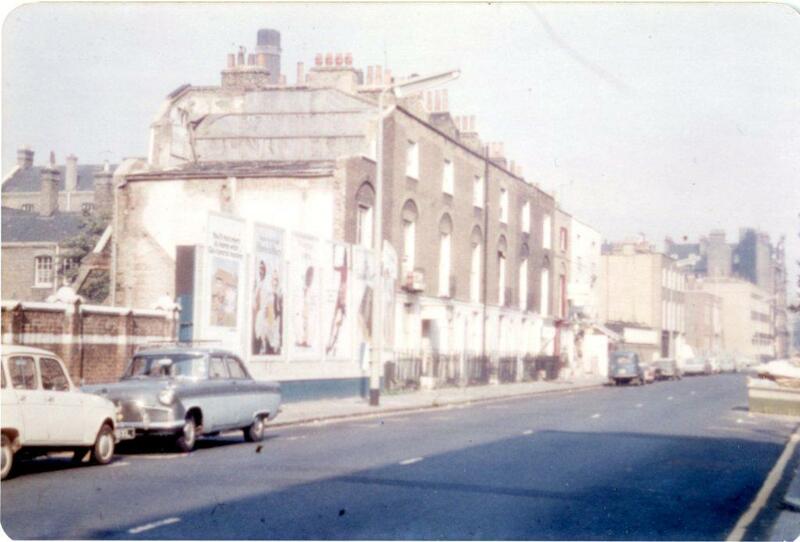 This is the view around the corner in Kensal Road, another carefully stapled image. 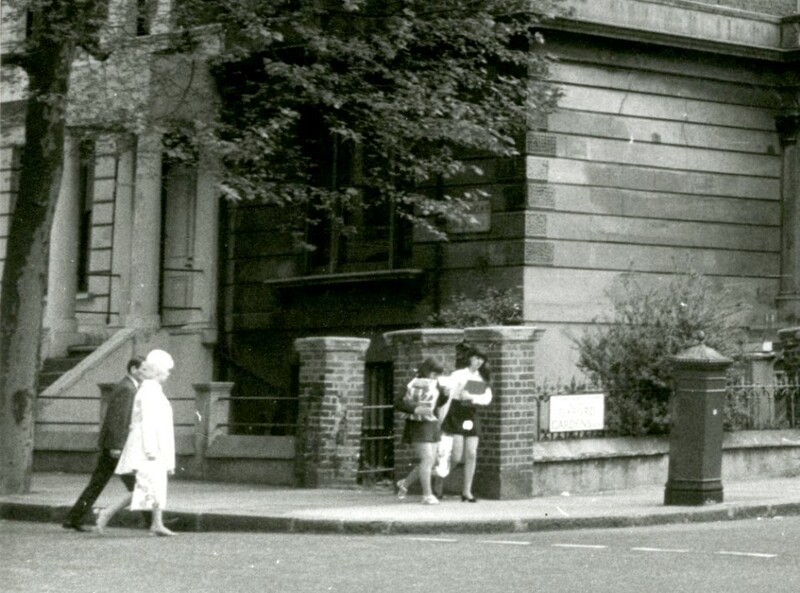 The building on which JM and his friends have left their mark were once the Vestry Offices. 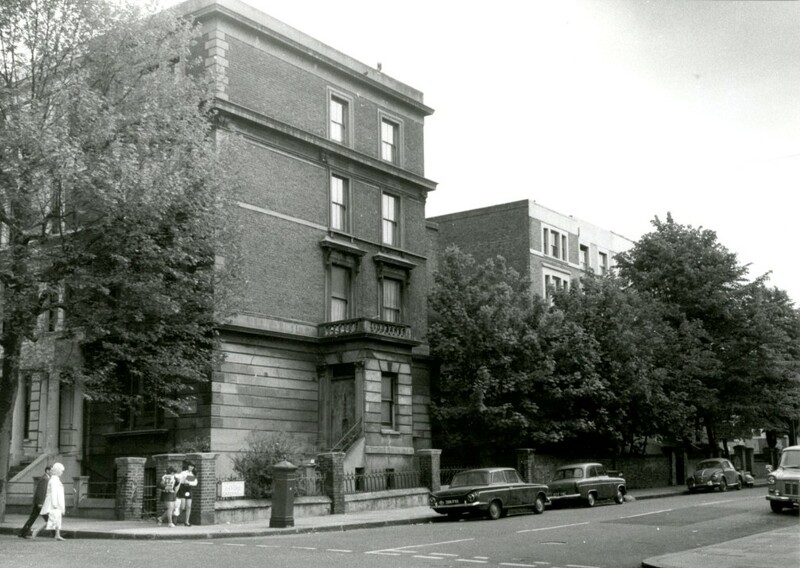 Historical note: up to 1900 the Chelsea Vestry owned a piece of territory called Kensal New Town which straddled the later border between Kensington and Paddington, so these Vestry offices originally belonged to Chelsea, as did the wharf, as we’ll see later. 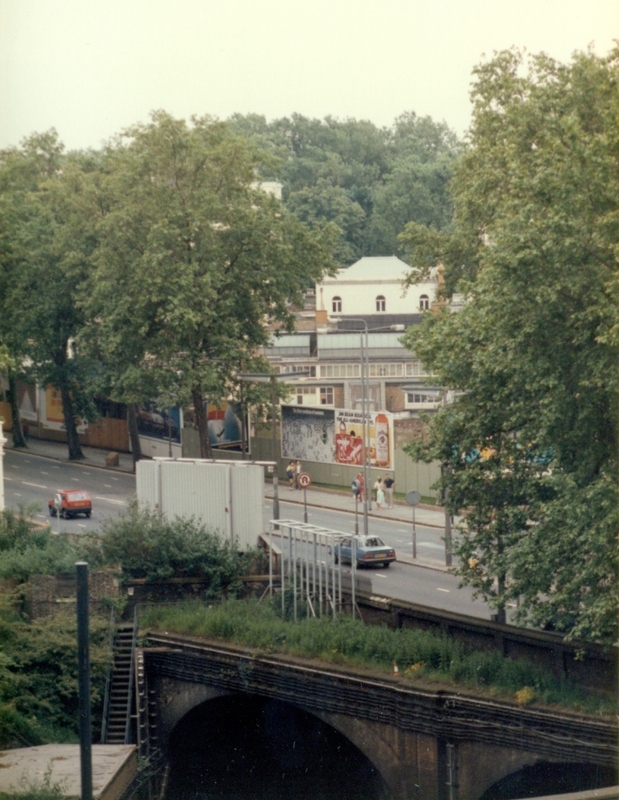 Kensal Road now runs from Ladbroke Grove to Golborne Road, ending more or less at Trellick Tower but it formerly went all the way to the Great Western Road, running parallel with the canal, and north of the railway line. This is why I wanted to look at this border area, the canal and the road, together. This week we’ll look at the canal, so back to the water. 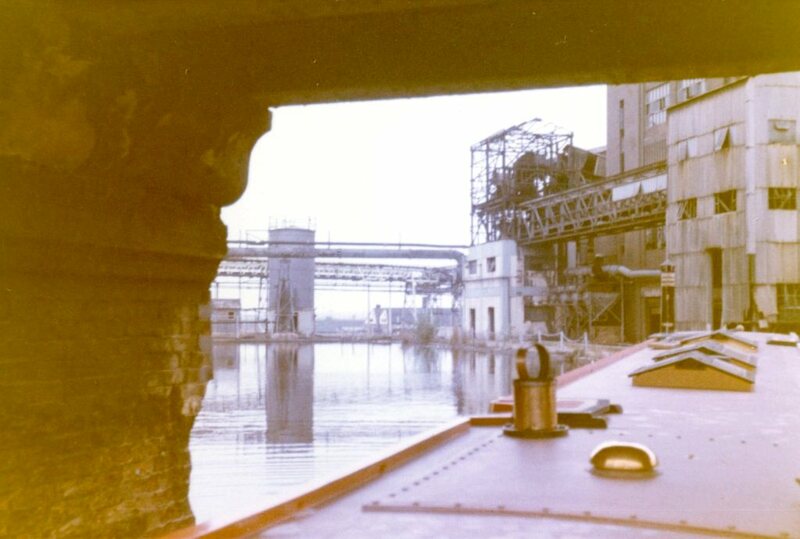 This view of the towpath is the last of this series from 1984. 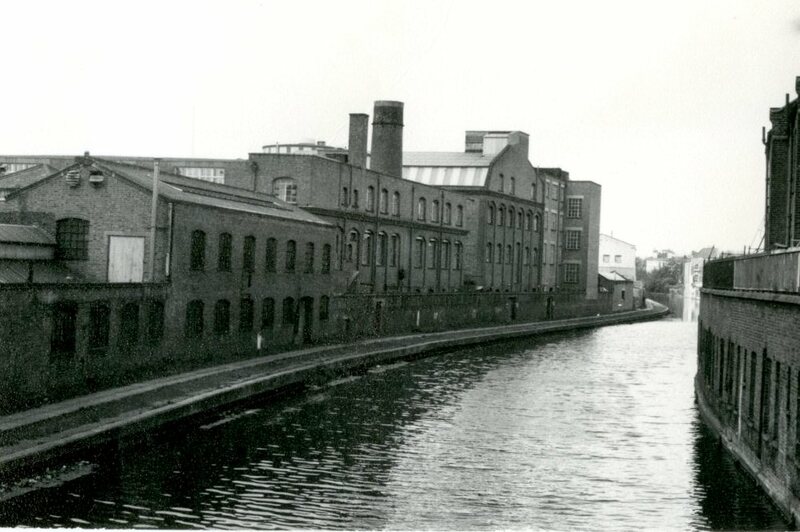 This older image shows the backs of the industrial buildings on the south side of the canal. This one gives a better view of the north side. 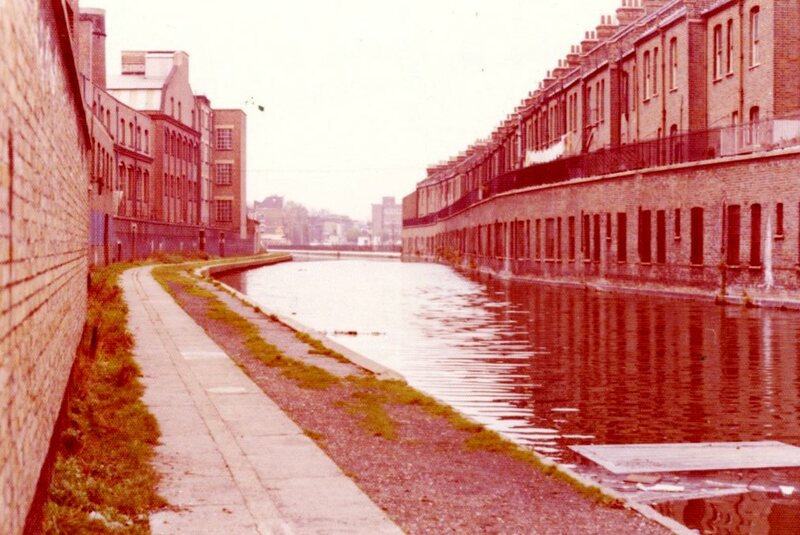 It’s a slightly discoloured image (some colour prints go that way) which shows how the houses and shops on the Harrow Road went right up to the edge of the canal. My houseboat correspondent tells me that one of these was the rear of a fish and chip shop and that boat people could get their order handed to them without leaving their boats. 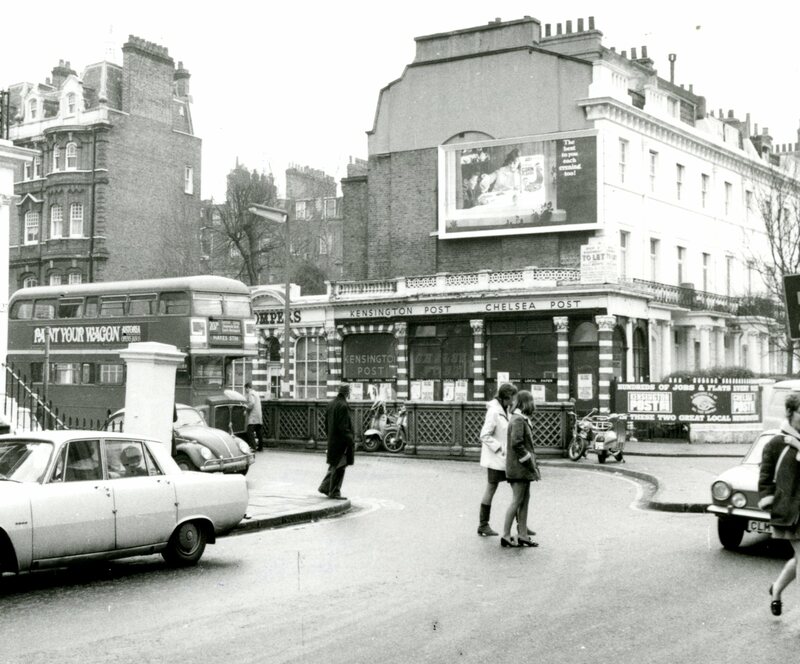 We’re heading west from this point back towards Ladbroke Grove. But before we get there we should stop off at Portobello Dock. These two pictures have been cropped from a contact sheet. (See the pen mark at the top of the image.) 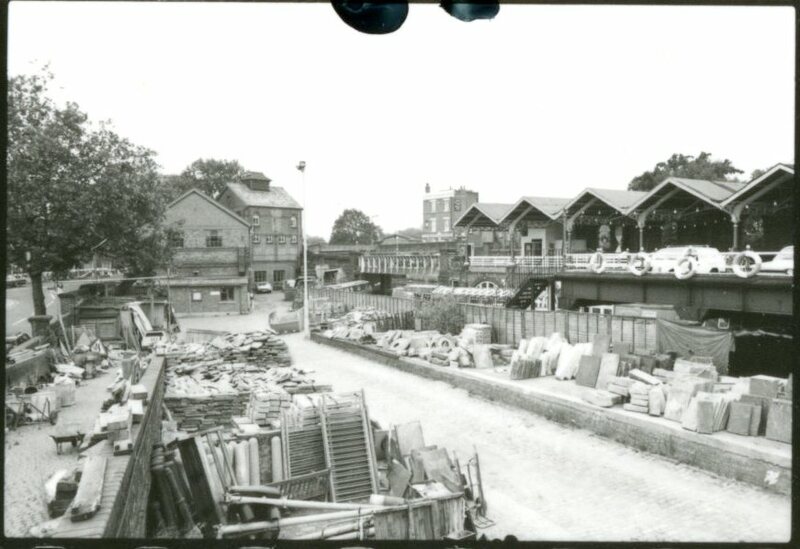 This one shows where the dock area could be entered from Kensal Road. This picture by local photographer Peter Dixon shows the somewhat waterlogged towpath with the gas works in the background and on the right the Narrow Boat public house. 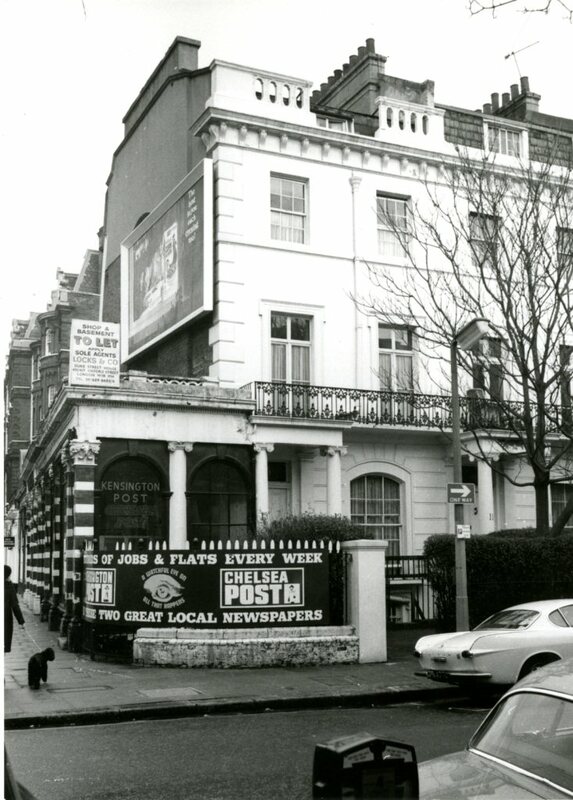 There is another photograph showing the now demolished pub by Peter in the Ladbroke Grove post I did a couple of years ago. 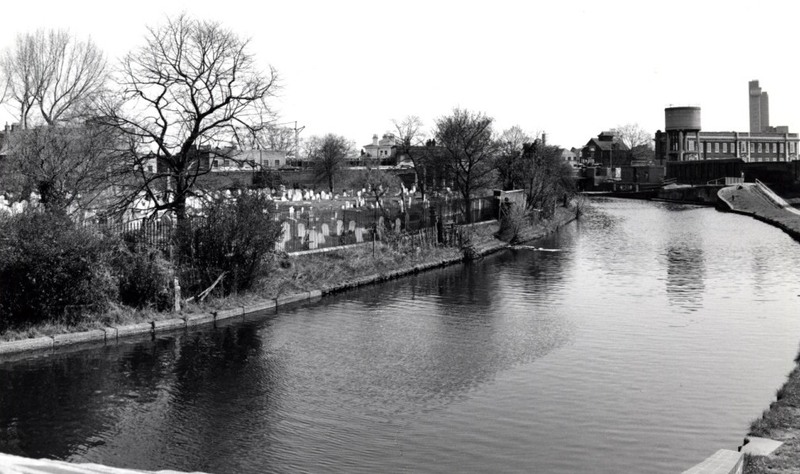 On the other side of the road, in a picture from 1975, you can see the gas works (covered quite extensively in this post) and on the other side of the canal, the wall of Kensal Green Cemetery. The gas works had two basins of its own. 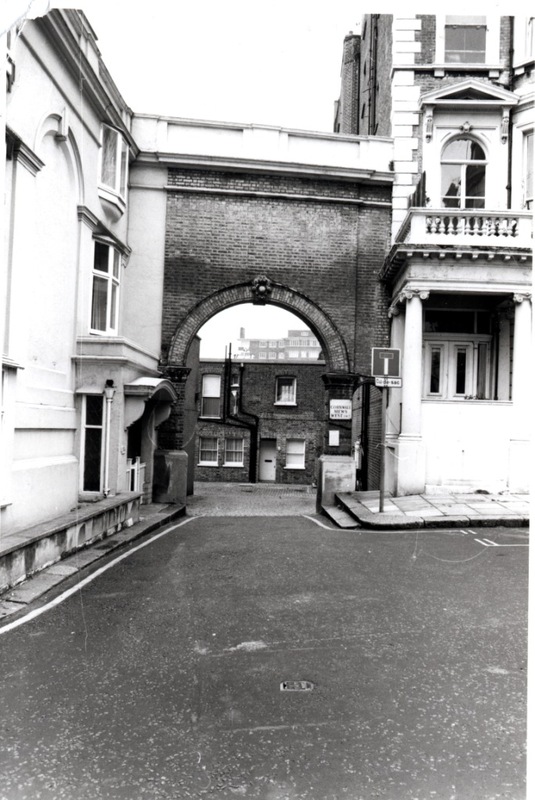 You can see the entrance to the smaller one (which still exists) in the foreground. The bridge over the entrance to the larger basin is visible in the distance. Here is a picture of a barge actually entering the basin. This view shows the rear of the barge as it performs this manoeuvre. 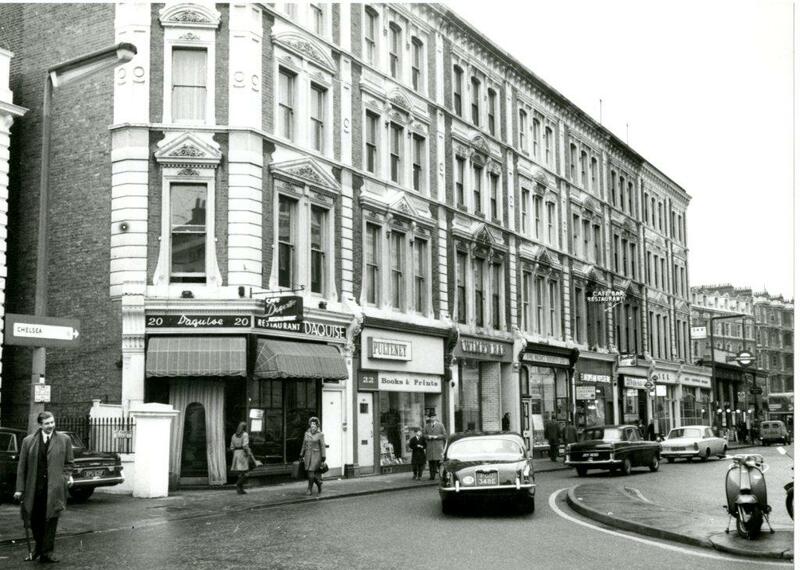 I think this is the smaller basin, about 1970. Back on the main body of the canal we carry on westwards. This view of the less grand section of the cemetery looks quite rural, as it would have been once. 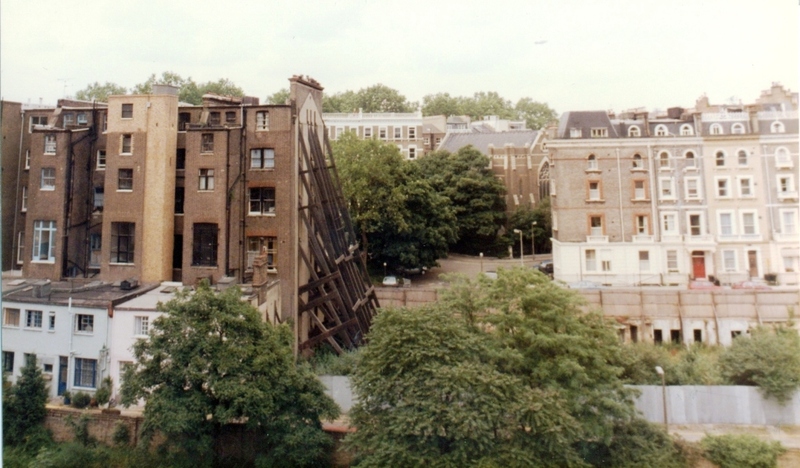 And finally, this view just around the corner gives us a traditional motor barge passing by a stand of trees with only the gasometer to give the setting away. 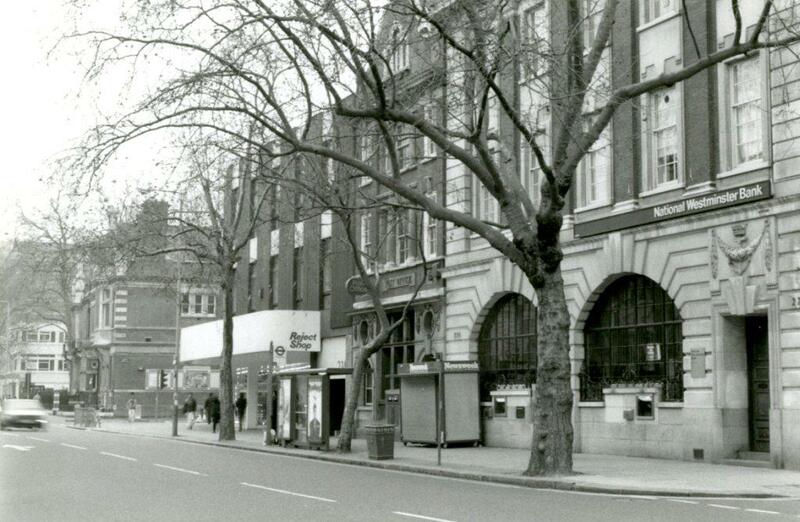 1970s we think, based on the plastic sheathed tree on the right. 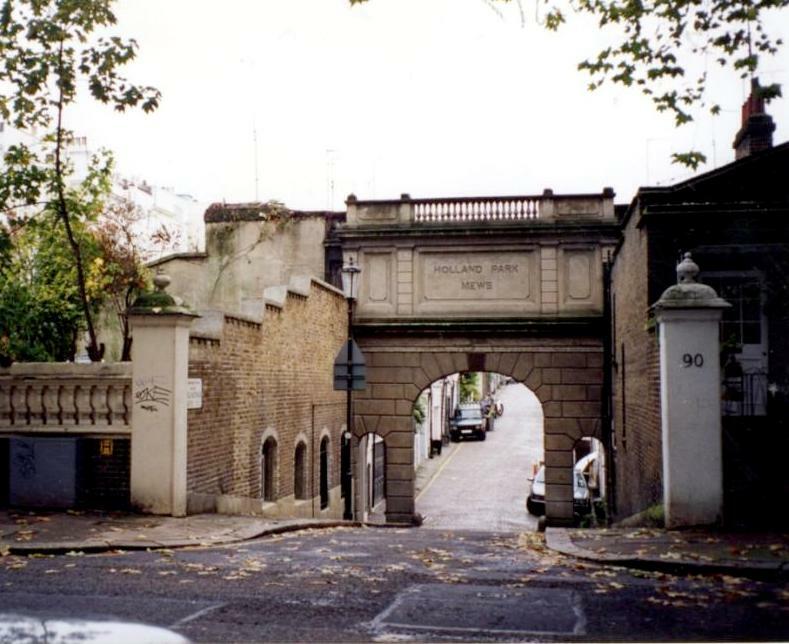 That takes us along the northern border of Kensington and Chelsea by canal. The next post gets back to the road. 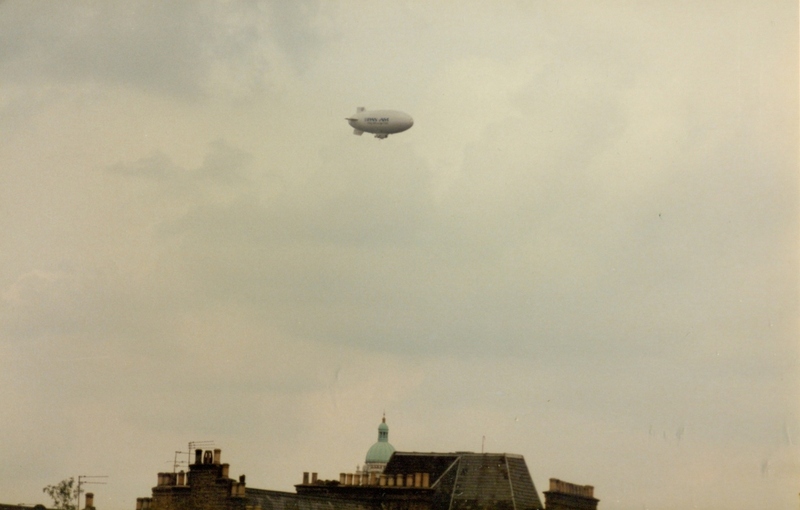 Thanks to Peter Dixon for his photograph, which is reproduced by permission. Please do not use it without his permission. 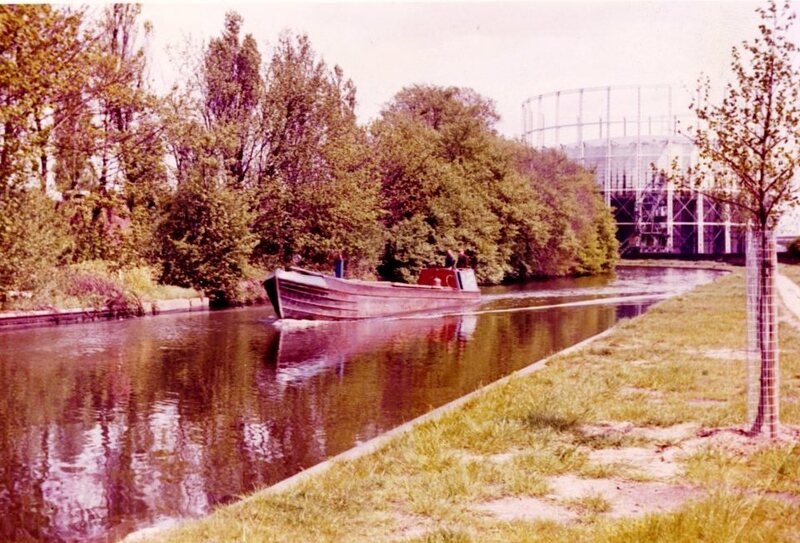 Thanks also to Barbara for providing the two pictures of the barge entering the basin, and for finding many of the others which come from our Planning collection. 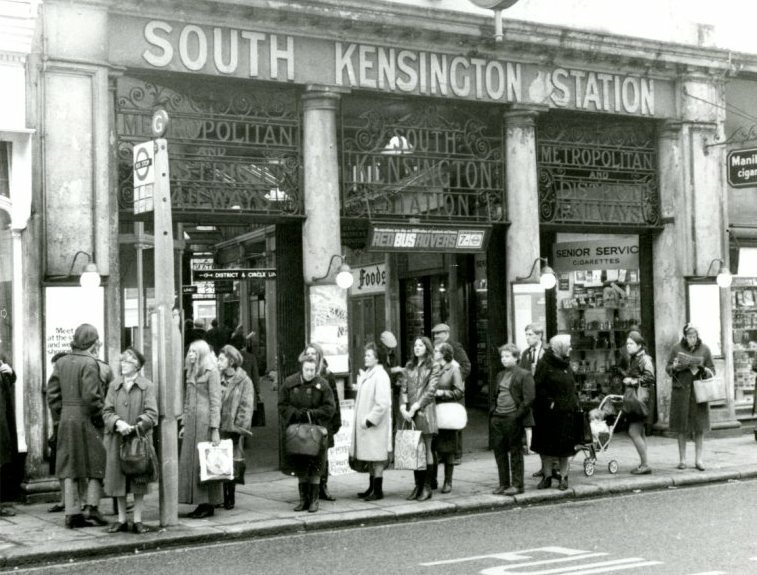 I’m grateful for the continuing interest of North Kensington residents in their history which is just as fascinating as the more “historical” parts of Kensington and Chelsea.